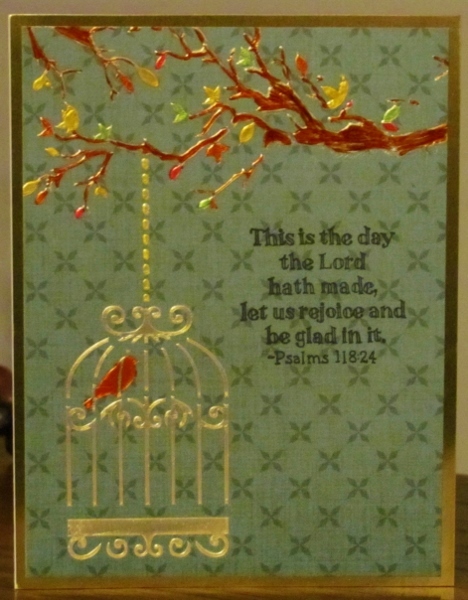 Paper crafting group challenge in October was 'birds and birdhouses'. I guess a birdcage is a bird house so that is what I did. I have a stencil that includes four birdcages hanging from branches with a couble of birds in the tree. I used tape to block out all but one of the birdcages and all the birds that were free. I kept the one bird inside the cage. 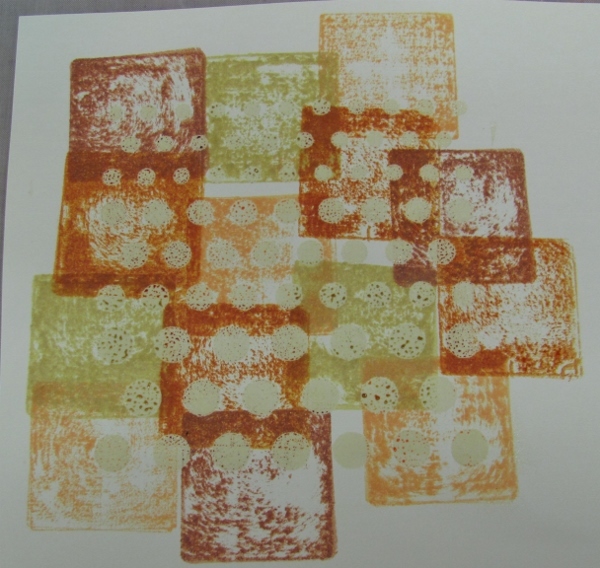 I used a squeegee to spread Liquid Pearls (color: bisque) through the stencil onto printed cardstock. 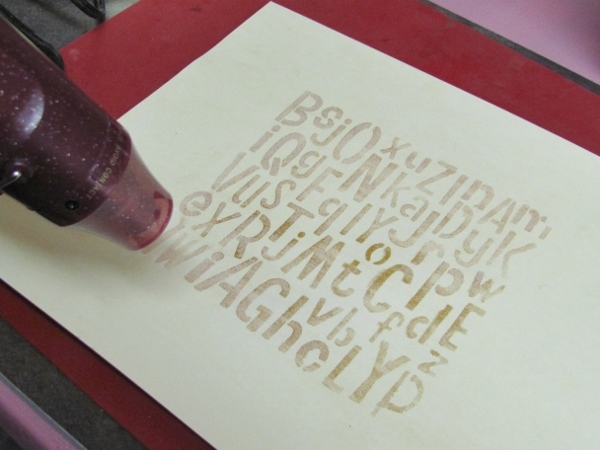 The stencil was removed and the pattern allowed to dry completely on its own. I then used Copic markers to color in the bird and the leaves and branches. I cut the panel to size and stamped a sentiment on the side. I mounted this on shiny gold cardstock, then to a folded card base. 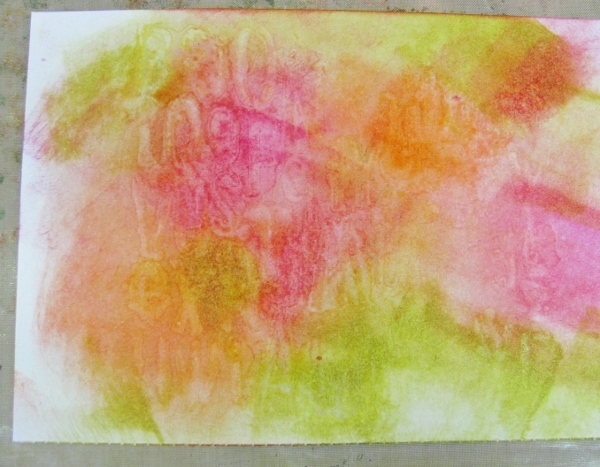 I liked the use of stencils in overlapping watercolor pencils that I did yesterday so I decided to do it again. This time I used three butterfly diecuts and arranged them in a rising flight design. Once again, the elements looked too flat, so I used a Sakura glitter pen to draw and color in the patterns that were on the dies. The effect is great in person but sure does mess up the photography! 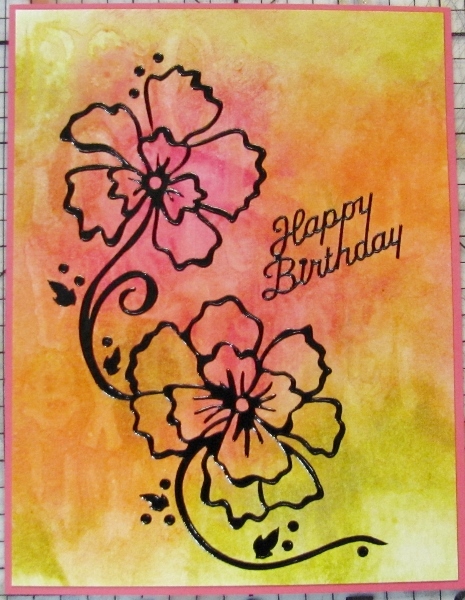 I ounted this on a patterned paper with yellow and grey chevrons. 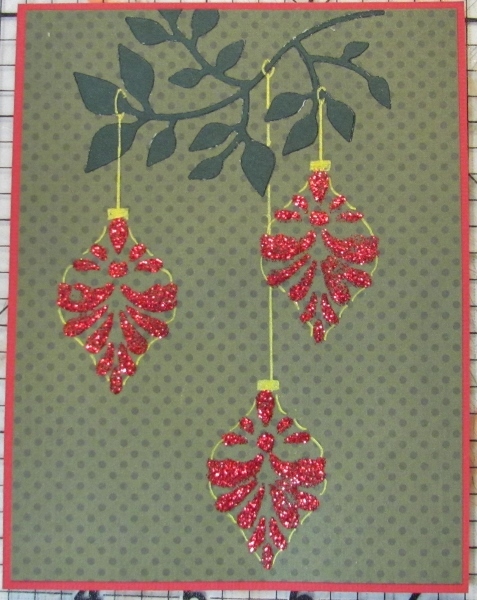 I stamped a greeting on the side and used the glitter pen on the double lines in the lettering. What am I going to do about this camera? I saw Sandy Allnock doing a watercolor pencil technique the other day on her blog and decided to give it a try. She was using the blanks left over from diecutting for her outlines but I already had stencils so decided to use that instead. 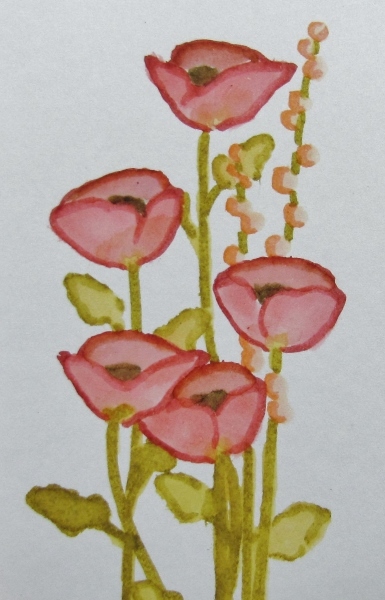 The stencil (mine were poppies) is laid over watercolor paper and traced partway around (I am using the bloom heads only) with a watercolor pencil. The next bloom is laid overlapping it and another color is used to draw the new bloom head. Where they cross one another an in-between color is used. 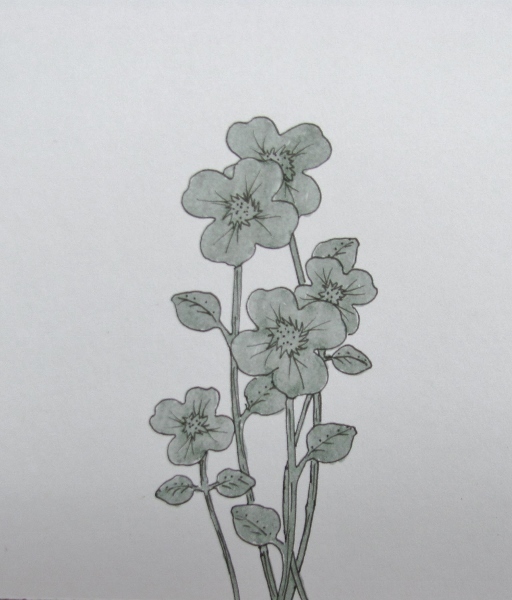 When all the flowers are traced the same pencils are used to lightly fill in the blooms with color. The stems and leaves are drawn in with green. An aquabrush was used to blend the pencil color inside the cross-over areas first, left to right. I then did the same with the stems and leaves and finally I went back to the left and did the blending on the bloom heads (this gave the first pass some time to dry a little before wetting the adjacent areas. I did go back with some contrasting colors and add a bit to the bottom area of the lighter blooms as a shadow area as they looked too flat. 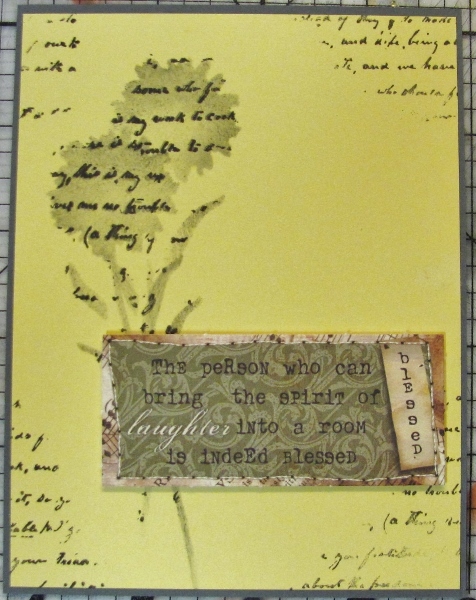 After drying, I trimmed the panel and stamped a sentiment in black and mounted the piece on a yellow base card. I also added a single doodle line in black to go with the sentiment. Sandy also did the same with a line of hanging Christmas ornaments and suggested that it would look nice with fall leaves as well. This could easily becoming a never-ending process! 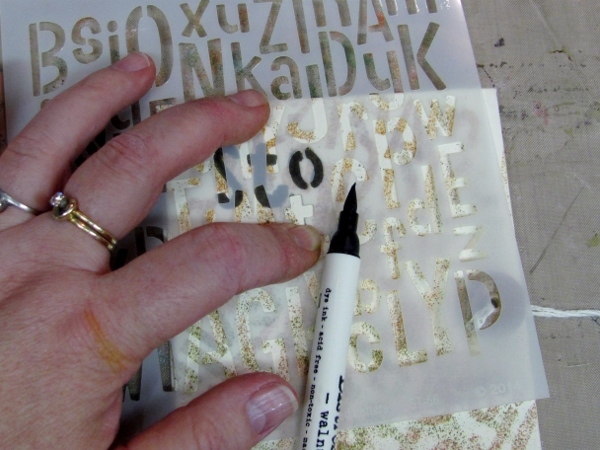 By sponging the Distress Ink through the stencil yesterday it left ink on the stencil surface. So I grabbed another piece of watercolor paper, misted the stencil and laid it down (wet side down) and held it in place for about 30 seconds. I dried this with a heat gun. 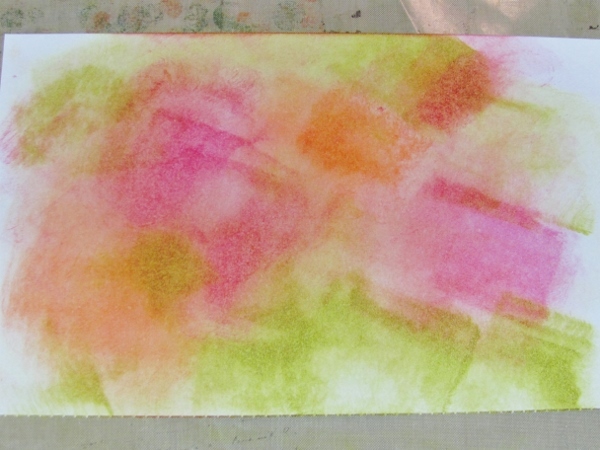 Then the background was too pale for me so I sponged Tea Dye Distress Ink directly onto the paper. 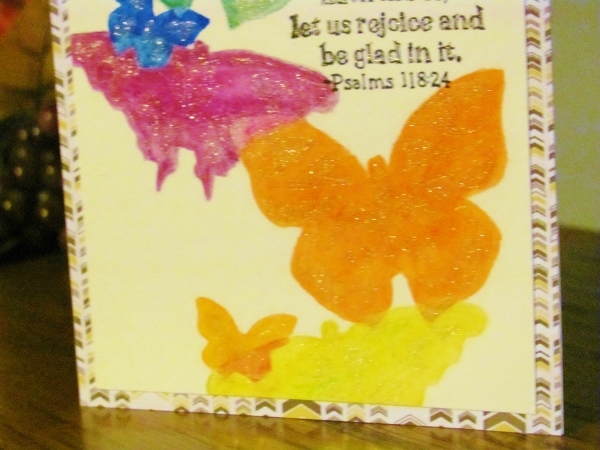 I also spritzed with Shabby Shutters and Mustard Seed Distress Markers using a bulb sprayer. This was decorated with table scraps and a stamped sentiment. 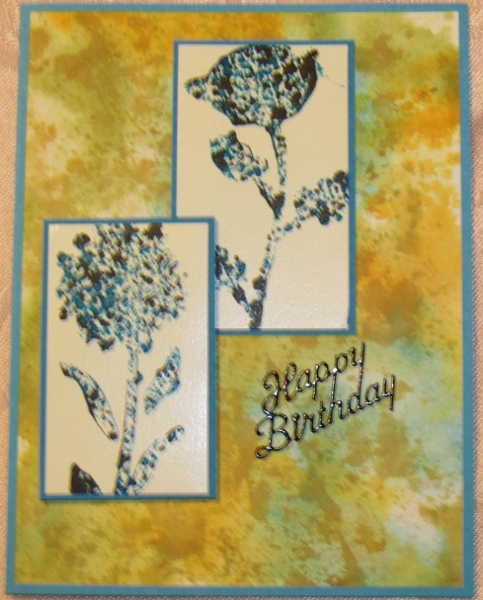 When I made the background for yesterday's card, lifting away the stencil pulls the color with it. Can't let that go to waste so I flipped it over and pressed it onto another piece of watercolor paper. I held it in place for about 30 seconds to let the color soak in. I liked it 'some' but it was pretty light. I dried the stencil and laid it back in place. 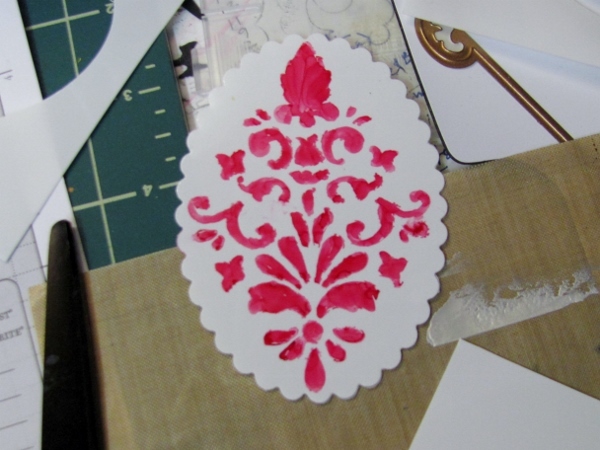 Then I used a foam applicator and colored the open areas of the stencil. I used a bulb sprayer to spritz over the surface with Shabby Shutters and Mustard Seed Distress Markers. 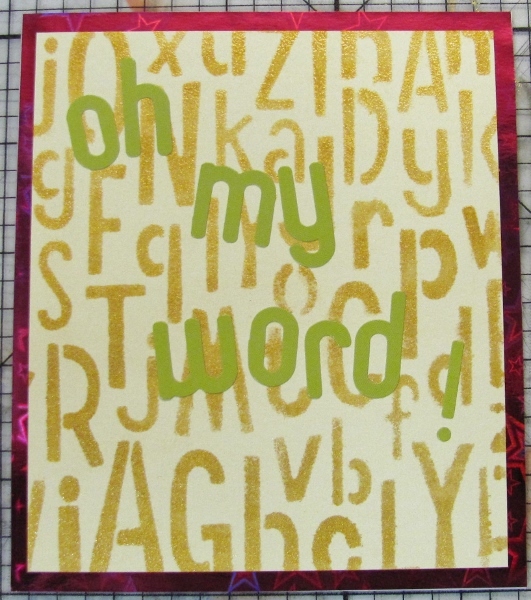 I mounted on a dotted card base and added table scraps and a stamped sentiment. Two bronze peel-off sticker leaves finish this one. While I liked the concept showed yesterday I wanted to try to get better contrast. I started with Distress Inks in Wild Honey, Rusty Hinge and Gathered Twigs applied to watercolor paper with a foam applicator. I chose a large metal stencil of leaves and misted it with water. This was placed water side down onto the colored paper and held in place for about 30 seconds. 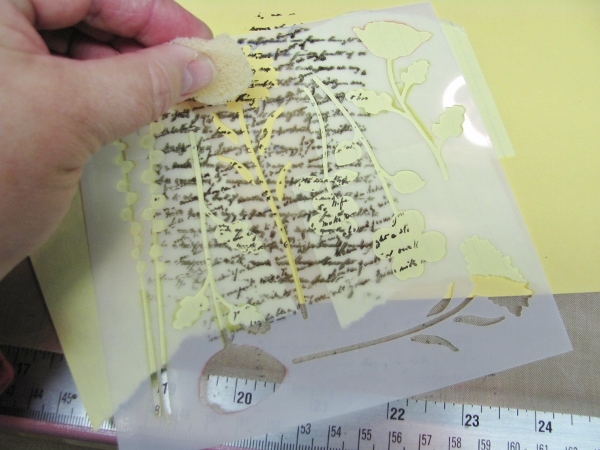 Then it was lifted and blotted with a paper towel. After dries with a heat gun I used a bulb sprayer to spritz with Shabby Shutters and Mustard Seed Distress Markers. This was a MUCH better result than yesterday's card. I had enough of this to make two card fronts. The first I placed on a goldenrod base and decorated with table scraps. I added some nail head stickers and gold peel-off stickers. 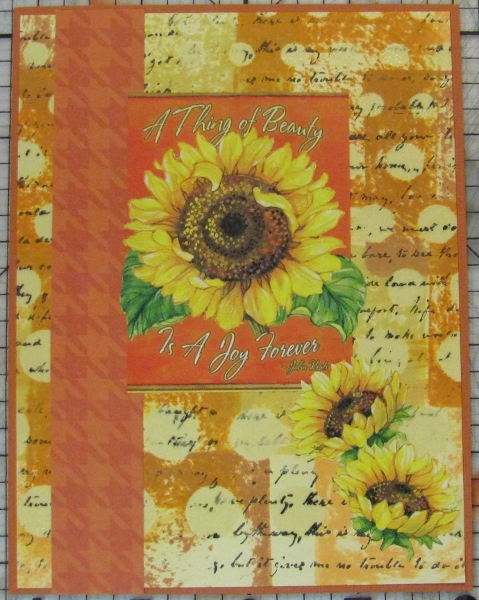 The other half of the paper was placed on a burnt sienna base and decorated with table scraps and a stamped sentiment. 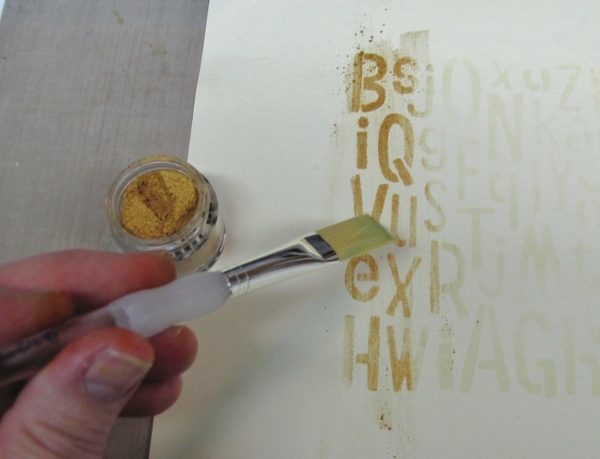 I was reading the Hero Arts blog the other day and came across this technique for using a stencil. It was what I had been aiming for when I did one of my stencil tutorials that kinda failed. 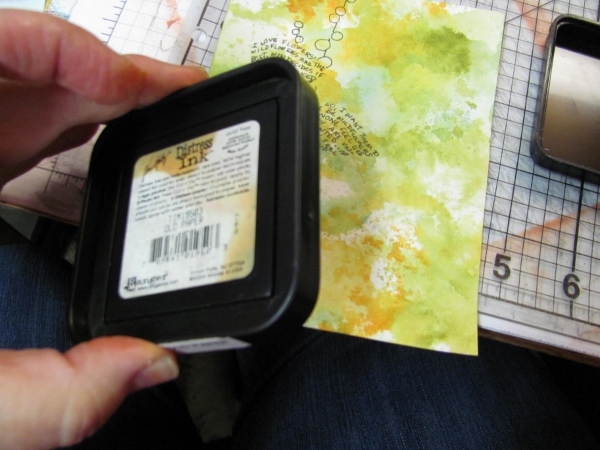 I had inked up my watercolor paper with Distress Inks using foam applicators then laid the stencil on top and spritzed with water to remove some of the color. What happened was that the water went under the stencil and I did not get clean outlines. Well, in the above link and also this one and this one a different approach is used. So I had to give it a go with these new instructions and got a better result. 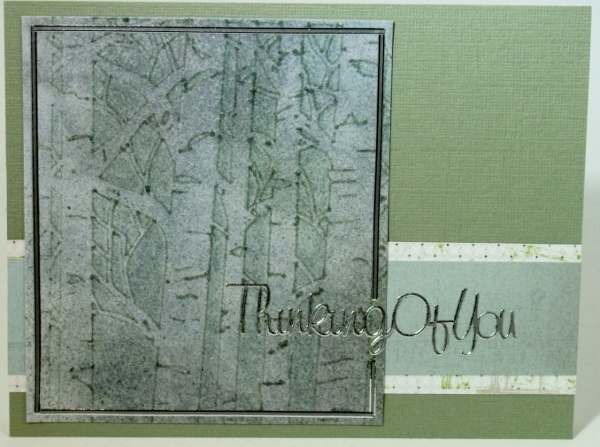 I started by using Distress Inks in Iced Spruce and Weathered Wood. 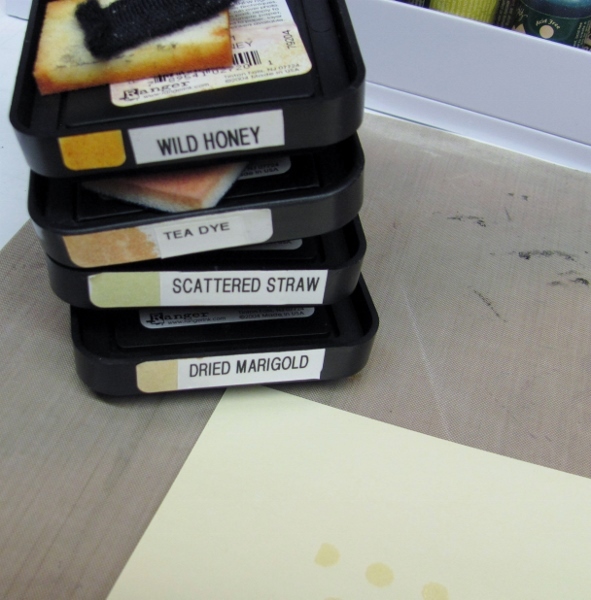 These were blended onto the watercolor paper using a foam applicator. Then I used a mister to spritz a stencil of birch trees and flipped it over (water side down) and placed it on the paper. I held it in place for about 30 seconds then carefully lifted it up. 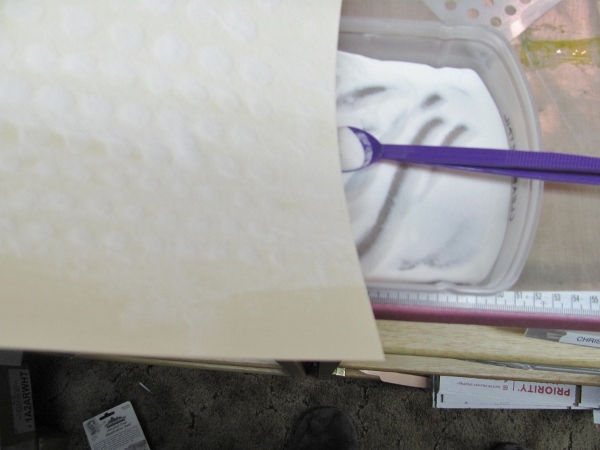 I used a paper towel to blot away some of the water and then dried it with the heat gun. The result was very low contrast so I laid the dried stencil back in place and drew around the shaped with a Distress Marker in Bundled Sage. I trimmed down to the best part and mounted this on doordinating green papers. All of the trim work and sentiment are silver peel-off stickers. Still in the 'follow the wandering brain' mode I set out to try another odd idea. 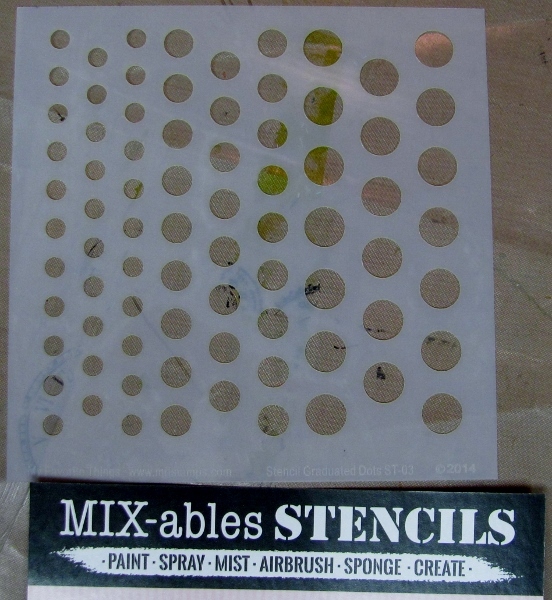 I had gotten some new spray colors in a product sampler pack and wanted to test them out through a stencil. So I got out the So I got out the Wildflowers stencil from My Favorite Things to try it out. to try it out. CRAFT FLOP (not all the way to a fail, but definitely not great). The problem was with the sprays themselves. I had turquoise and black. Did they mist, spritz or spray? No, they snorked, blobbed and blooped. I tried spraying farther away, but that was no help. Turns out the paints were more like an acrylic than a watercolor in viscosity and transparency. 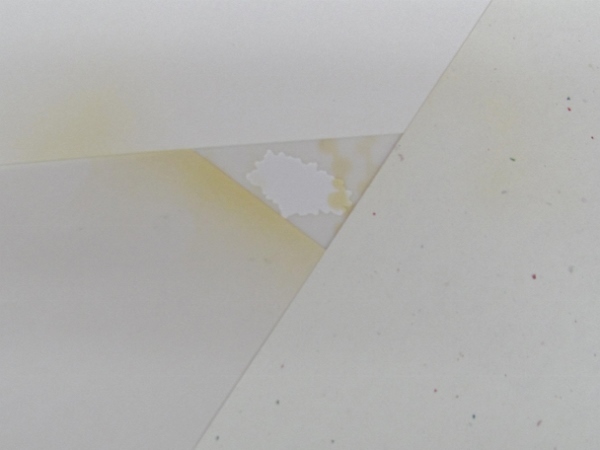 Also, I was using glossy cardstock and they were designed for 'porous' surfaces so they sat on top and did not dry well. I finally had to hit them with the heat gun to dry. I heard in my head the well-known quilter, Bonnie Hunter, who says (regarding fabric), "If it's still ugly, you just didn't cut it small enough!" Well, the spritzed cardstock I had in hand was obviously not cut small enough because it was hideous. So I cut out two areas that were passable and bordered them with teal. I decided to use them both on the same card and found a scrap of 'wrinkle-free distress background' left over from a precious project. Well, look at that, it has teal in it. I can work with that! I bordered it with teal as well and popped one of the flowers up on foam tape. 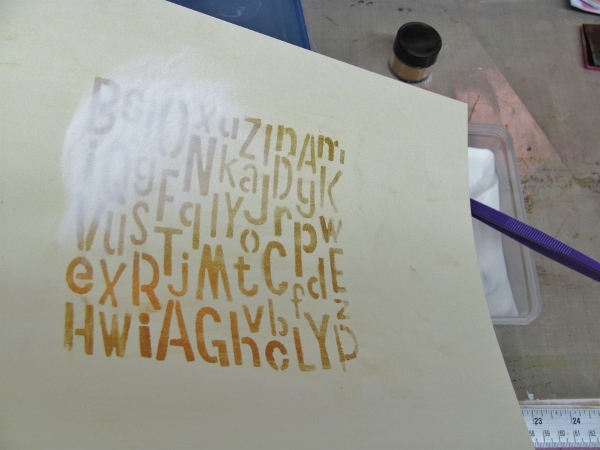 While making the card that finally worked (posted yesterday) I wanted to try to 'rescue' the gold pigment ink left on the Scrolled Background stencil from My Favorite Things . So, while it was still wet I flipped it over onto blue cardstock, covered it with scratch paper and burnished it with my hands. Surprisingly, it did not give full coverage as I expected, but left behind all the lines that trace the cutouts. Very delicate look. I decided to heat emboss this with clear detail powder and the result was stunning. So much that I trimmed only enough to make it fit on the card front. It reminded me of stained glass so I pulled out some gold peel off stickers of religious emblems and built a scene with them. This included a greeting at the top. 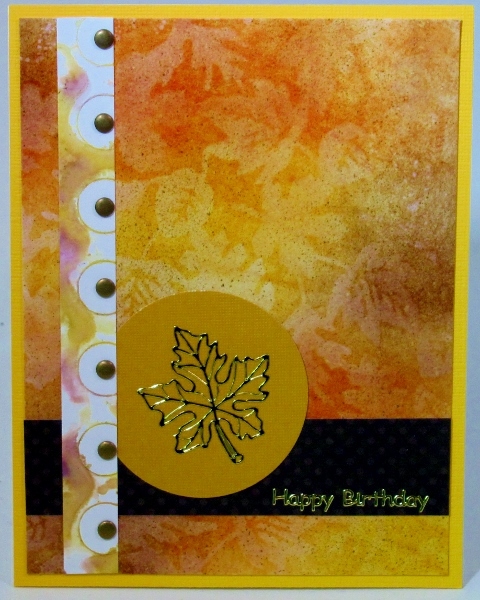 I used a dark yellow base card which works well with the gold stickers and embossing. Oh, sometimes my brain just wanders off on its own and starts dreaming up all kinds of projects. Then it's up to me to go try them out and see if they work as imagined. Sometimes they do and sometimes not so much. 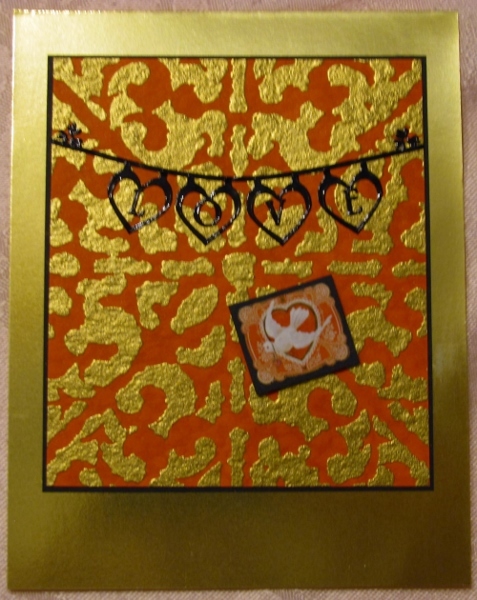 I had this idea to use a glue pad (like a stamp pad but it has glue in it) pressed through a stencil onto cardstock and then stick gold leafing on with it. CRAFT FAIL! The leafing did not stick well to the glue and this left spots of glue uncovered on the piece. Of course, the glue collected everything else and then it looked grungy. Tossed it out! 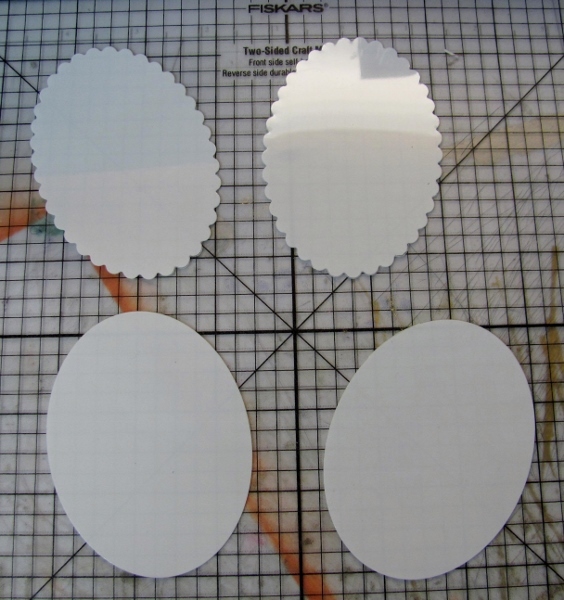 Nest idea was to apply the same glue in the same way and use it to adhere foiling. CRAFT FAIL! Unfortunately, the foil I had was designed to stick to laser printer toner when heated. I tried heating with the heat gun to release it and it worked to some extent but a lot of the glue was left uncovered as before. Tossed it out! Is the third time the charm? YES! But not exactly like I had planned it. 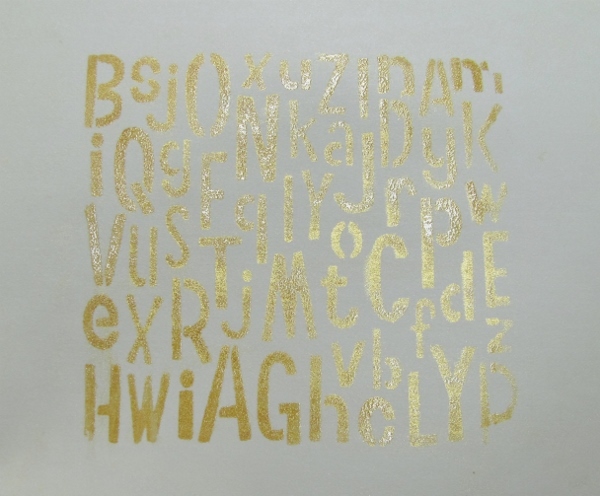 The plan was to press a gold pigment ink pad through the stencil and heat emboss with clear powder. The gold ink, though, had too dull a look for me. I wanted SHINY, so I used gold detail powder. 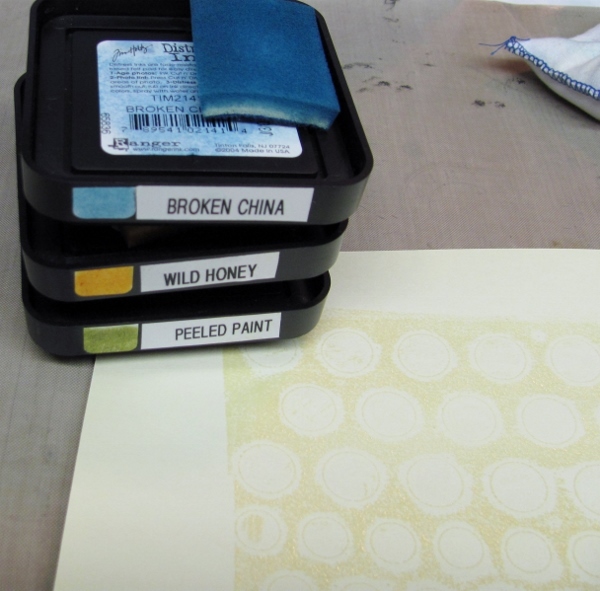 Yes, it totally covered up the gold pigment ink, which was then redundant. 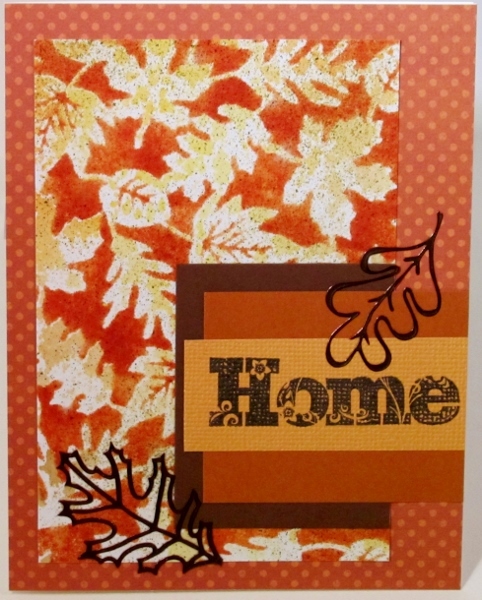 In any case, there was success when I used this process on red cardstock with the Scrolled Background stencil from My Favorite Things. I cut down the resulting panel and bordered it in black. 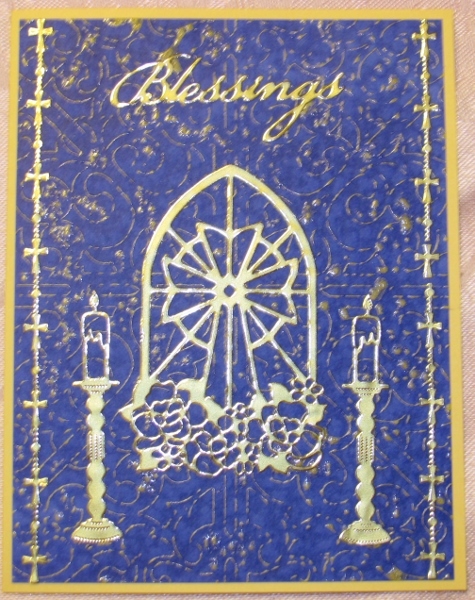 Nothing I tried for the card base really worked until I hit on this shiny bright gold cardstock. It was perfect. I found some black peel off stickers arranged them to create a text banner. A little 'valentine' sticker bordered in black finishes it off. The small sticker is popped up on foam tape. I ran across a stencil technique on someone’s blog that I had not used before. So I got out the Wildflowers stencil from My Favorite Things to try it out. 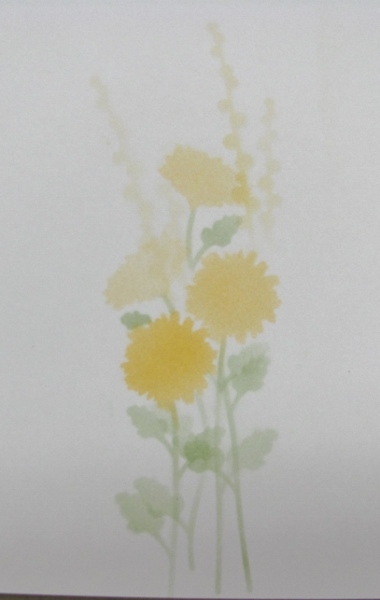 This is the stencil I used - selecting just the two daisy shapes and the tall weeds. I don't have a photo tutorial to go with this technique - just a verbal description. 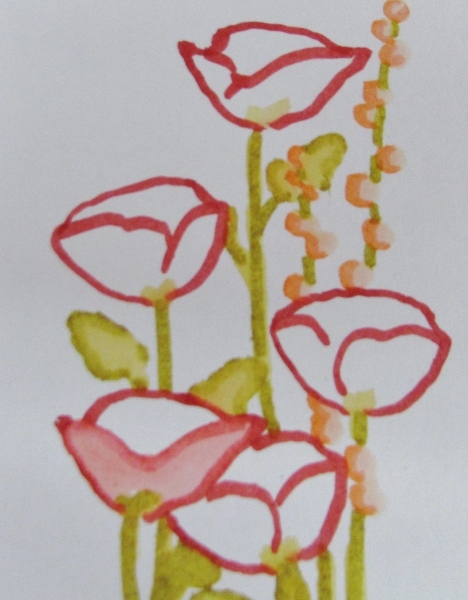 I laid the stencil on watercolor paper and used watercolor pencils to scribble color into the blooms, leaves and stems where I wanted them to appear. I moved the stencil around to add more flowers. Then I used an aquabrush to blend out the colors and then added more pencil where I wanted additional color, Including a light blue 'sky' behind the flowers. This was also blended with water. I trimmed the panel to size and then used a pencil to sketch a border and blended this into the background. 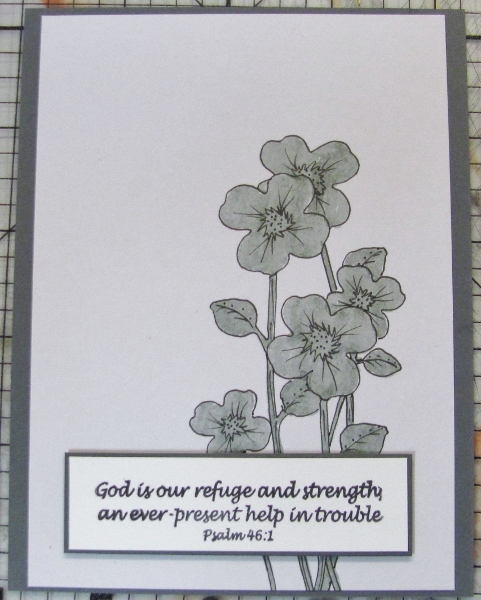 I mounted this onto a base card to match the flowers and added a text sticker. This technique actually makes it look like the illustration is hand-drawn. Very cool! 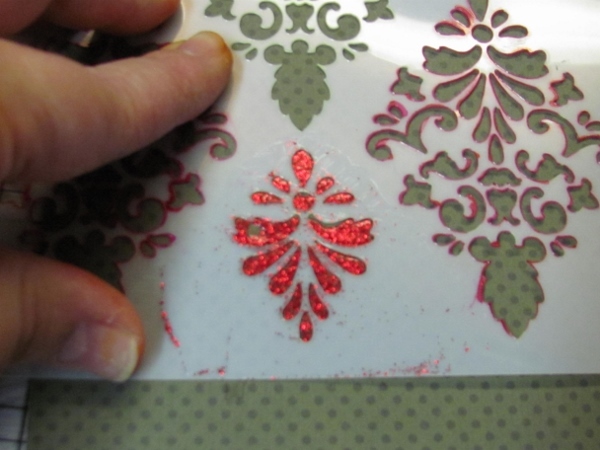 I have one more technique using the Damask stencil from My Favorite Things to create a Christmas card. This time I wanted to use the smaller motif for the design. 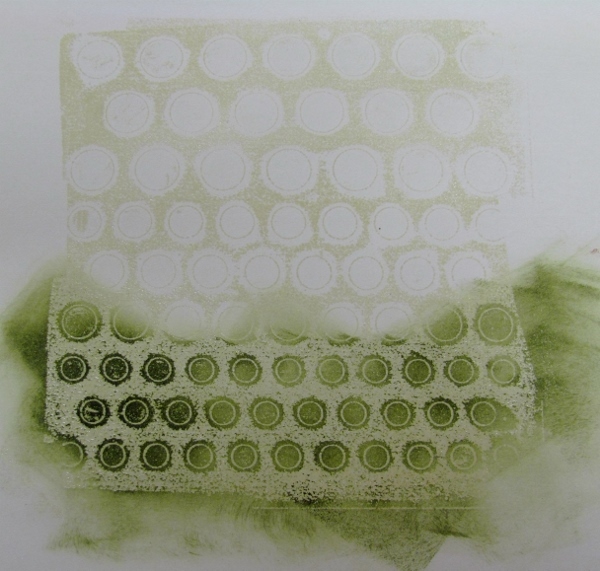 I selected some tone-on-tone green dot paper and laid on the stencil. 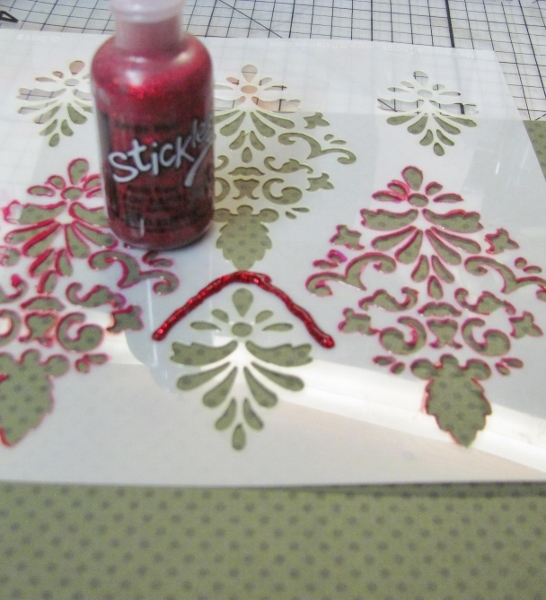 Then I dispensed a thick roll of Stickles red glitter glue above the top of the motif. 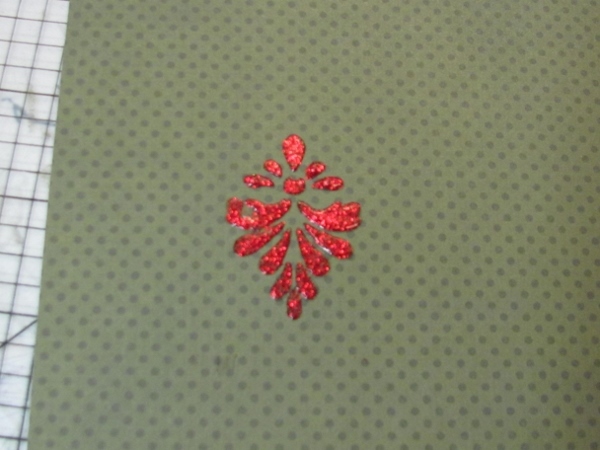 I used an old gift card as a squeege to pull the glitter glue into the openings of the stencil. You might have to add more glitter glue to the top and squeege again to get enough fill. Lift away the stencil and CLEAN IT. Here's your first ornament. 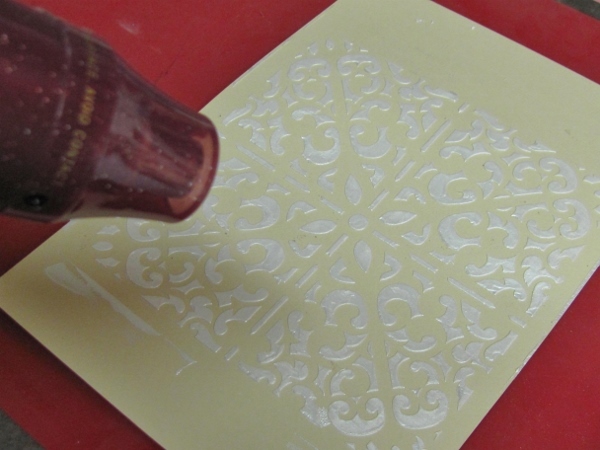 When this ornament is dry you can add another and another (otherwise you risk getting wet glitter on the back of your stencil and ruining your design. When all my ornaments were dry I trimmed the piece, added some die-cut branches and drew in some hangers and caps with gold gel pen. I also used the gel pen to sketch in some outlines. This was mounted to a red card base to enhance the ornaments. 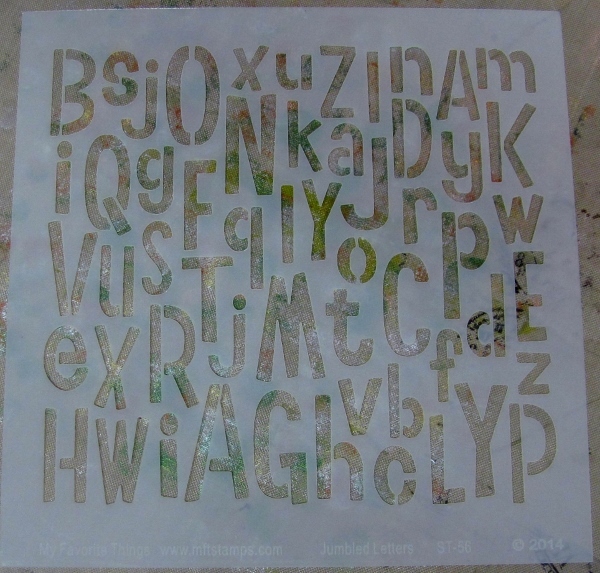 Today, I again have two techniques, this time using very different approaches to the Jumbled Letters stencil from My Favorite Things. 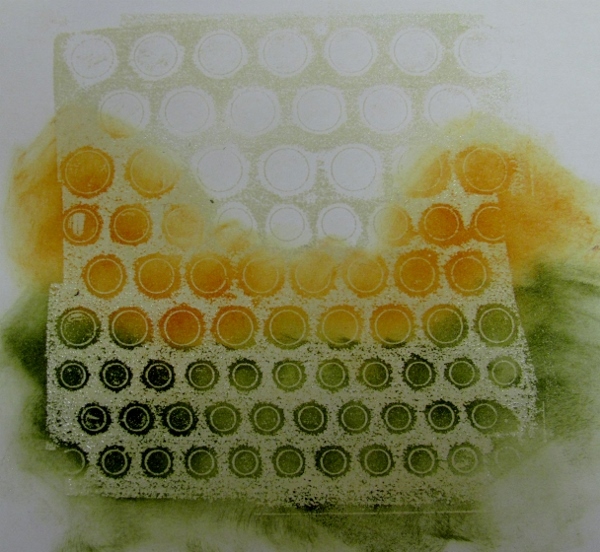 The first technique starts with watercolor paper and uses Distress Inks. 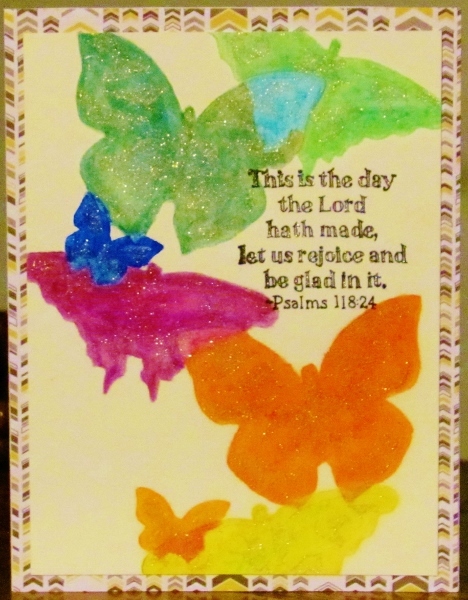 I used the foam applicator tool to cover the surface with three colors of Distress Ink. 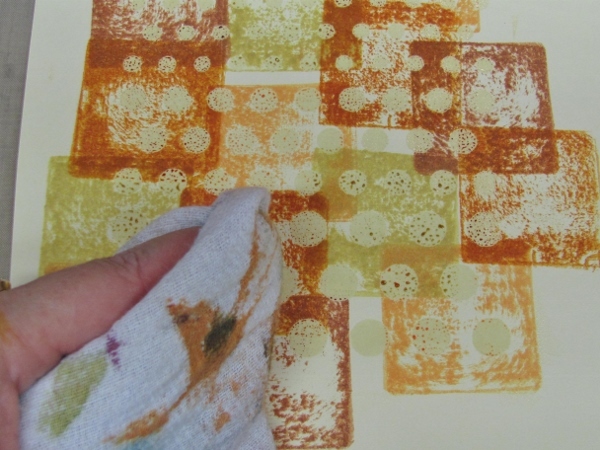 Then I laid the stencil over the top and used a damp rag to try to scrub away color. CRAFT FAIL! 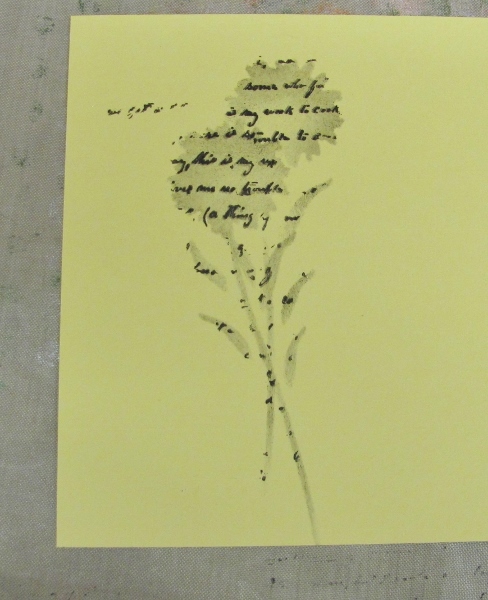 The ink did not come up as much as I had hoped and the water leaked under the stencil giving mushy edges. It may not be what I wanted but I trimmed it down and used it anyway. I love the card that resulted when I used black Dazzles on it. Nobody has to know that this was not the look I was going for! 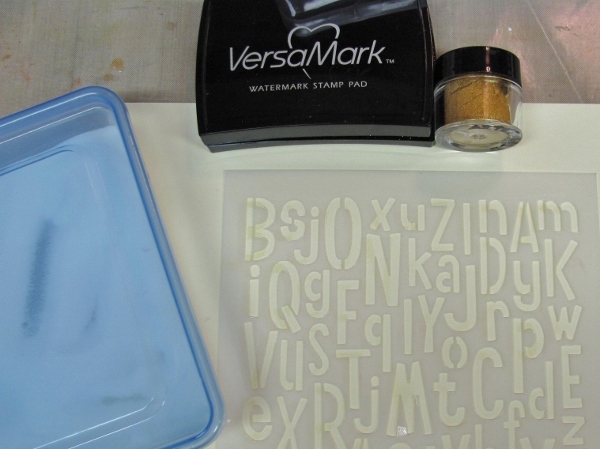 This technique uses Versamark, Pearl-Ex powder and clear detail embossing powder. I used cream cardstock for this technique. First, I treated the cardstock with an anti-static bag. 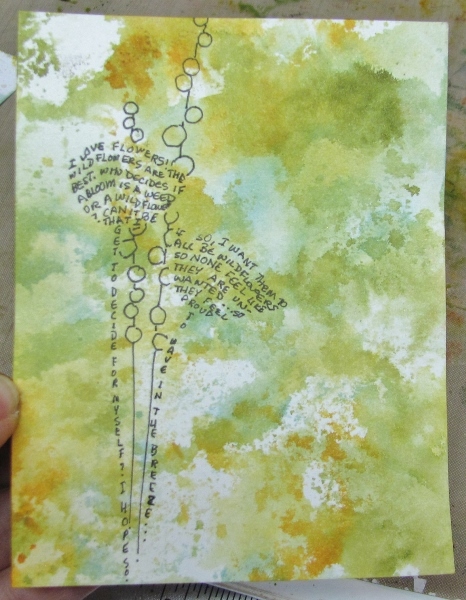 Then I placed the stencil and mooshed Versamark Ink through the open spaces. I used a soft paintbrush to dust on the Pearl-Ex powder (I used antique gold). 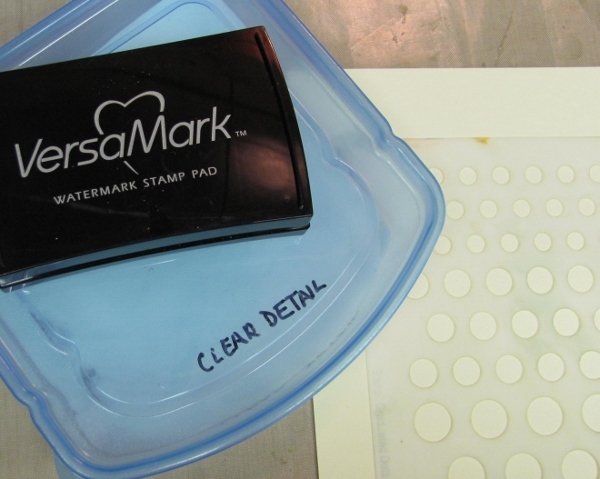 Gently dust away surplus Pearl-Ex and then add clear embossing powder. It will still stick to the Versamark! 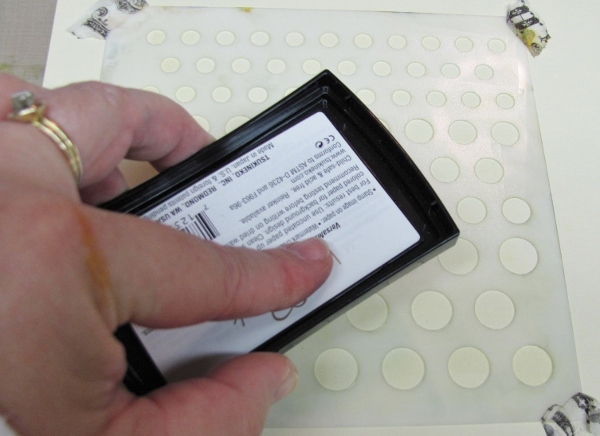 Heat set the embossing powder. Repeat after me: "ooooh, aaaaah". 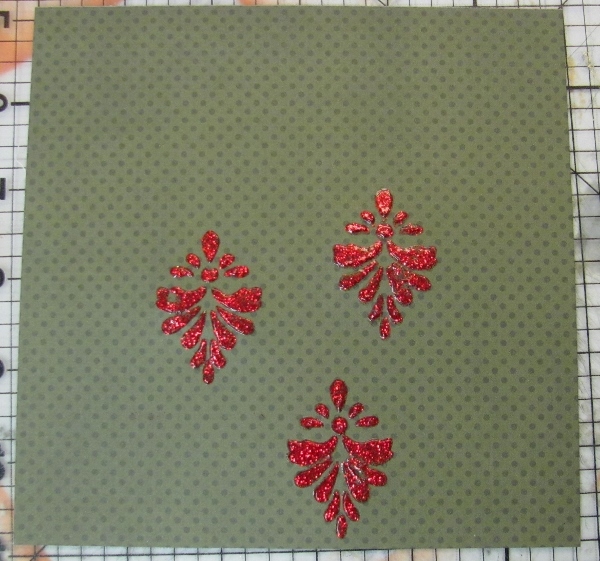 Trim and turn into a card front. I decorated mine with cardstock stickers. Want more? 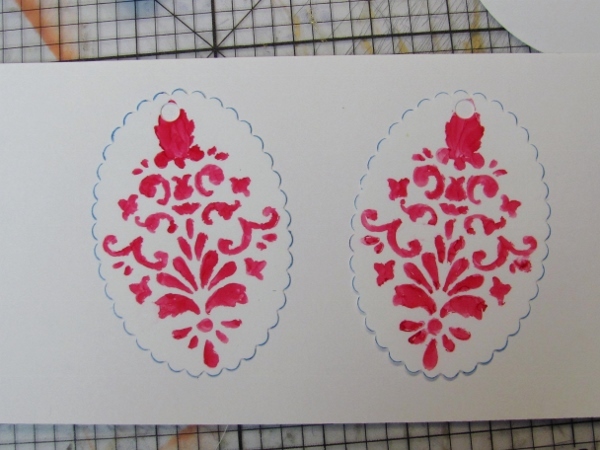 The last stencil tutorial is tomorrow - though I might have a bonus one next month! 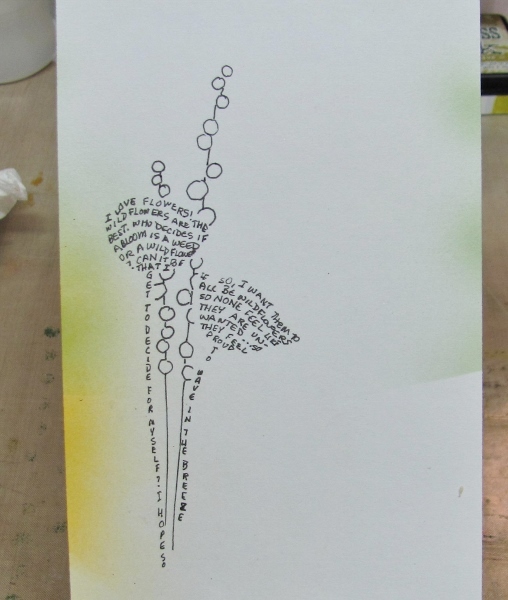 I have two techniques again today, both involving text as a design element and both using the Wildflowers stencil from my recent order from My Favorite Things. I wanted to try stamping through the stencil to see if it was thin enough to allow the stamped image to imprint right to the edges. I needed to use a very open bloom for this so I chose the face-on daisy. I selected the 'unreadable text' stamp. 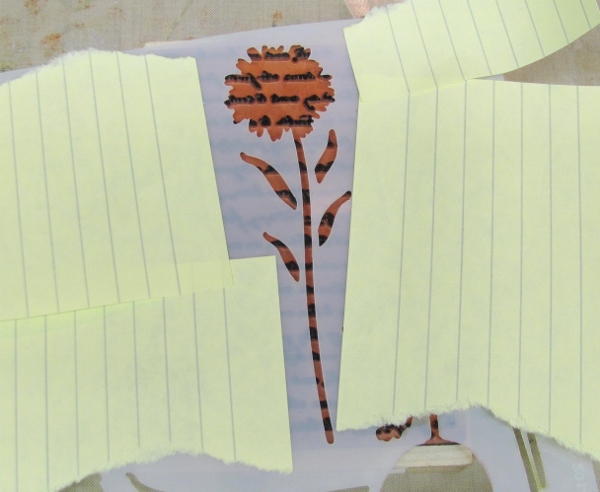 The stencil areas not to be imprinted were masked off with torn post-its. Then the stamp was inked all over while laying face-up on the table. 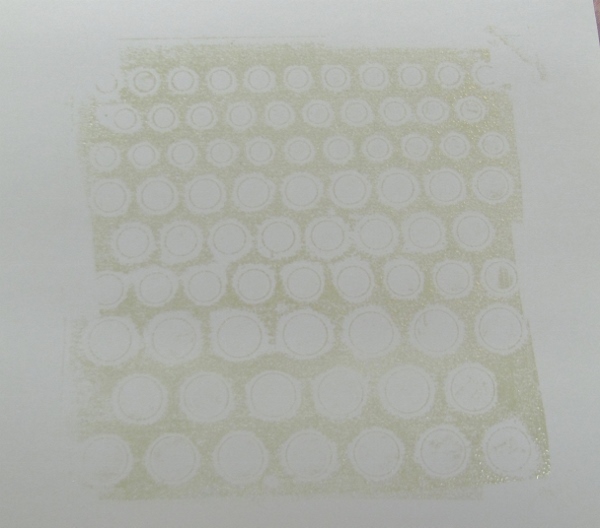 The masked stencil was placed on the inked stamp. 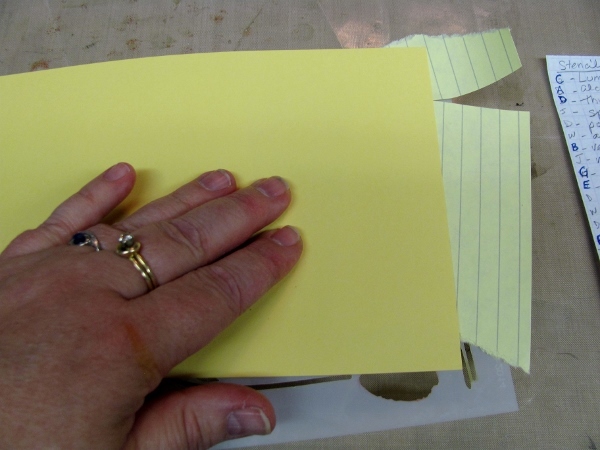 Then the dark yellow cardstock was placed on the stencil and I used my fingers to work the area over the stencil to transfer the stamped image through it to the paper. DO NOT CLEAN THE STENCIL. The result of a single impression. 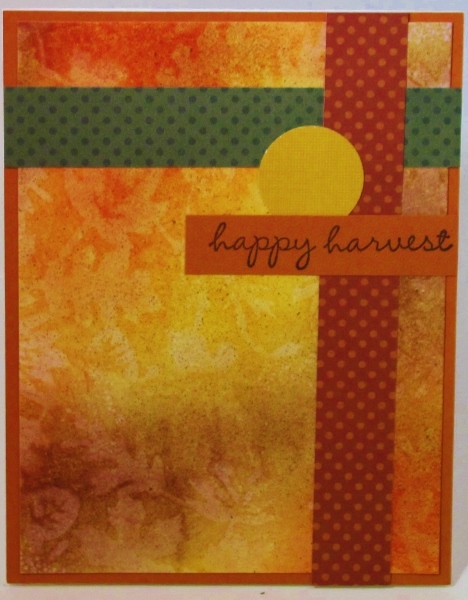 I inked the stamp and placed the stencil again and made a second impression on the cardstock. DO NOT CLEAN THE STENCIL. 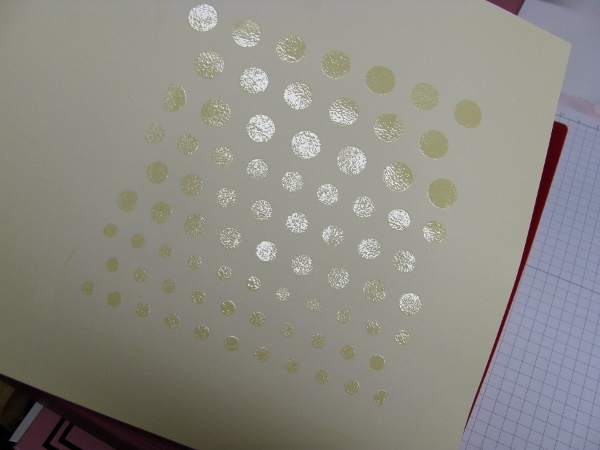 Then I laid the cardstock with the image facing up and arranged the stencil over one of the stamped areas. I used a bit of sponge to smear the ink on the stencil into the open area thereby turning it into a silhouette. After trimming to size I used the text stamp to add decoration to the four corners. 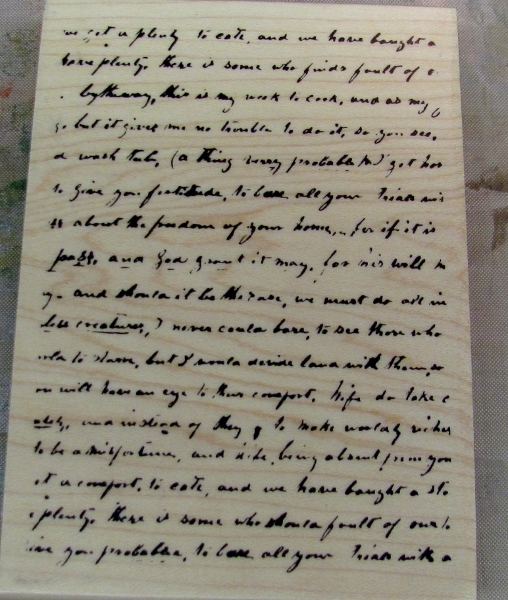 This was then mounted to a bordering color and decorated with a die-cut tag. 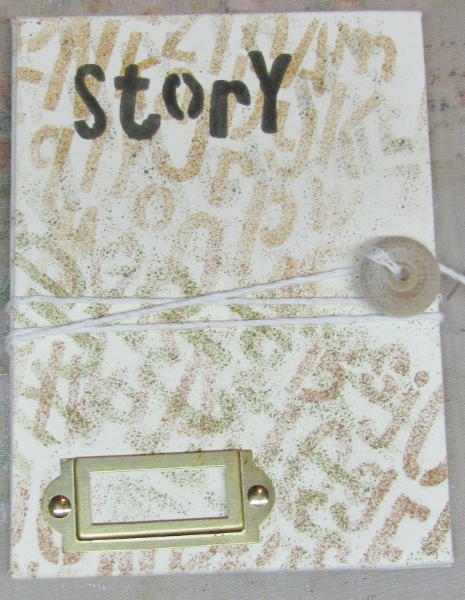 I wanted to continue with the theme of text decoration but had an idea about using journaling as the 'fill'. 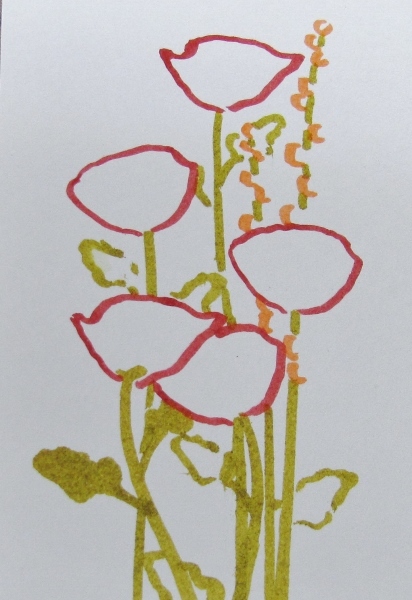 I placed the poppy stencil on white cardstock and used a very fine line marker to write within the bounds of the silhouette. 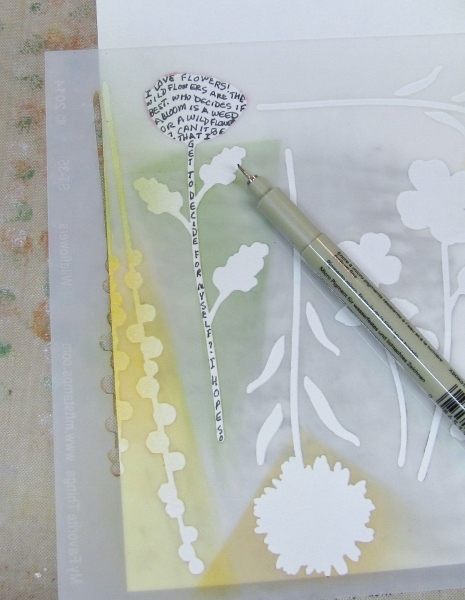 When I got to the stem I made the journaling vertical, leaving out the leaves entirely. 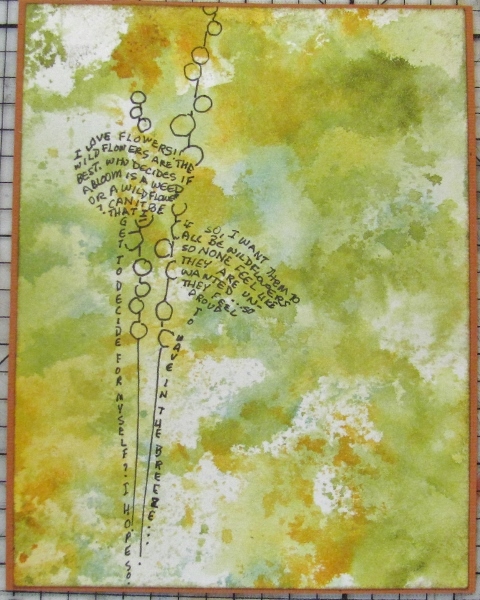 I used the second poppy stencil to add more journaling. 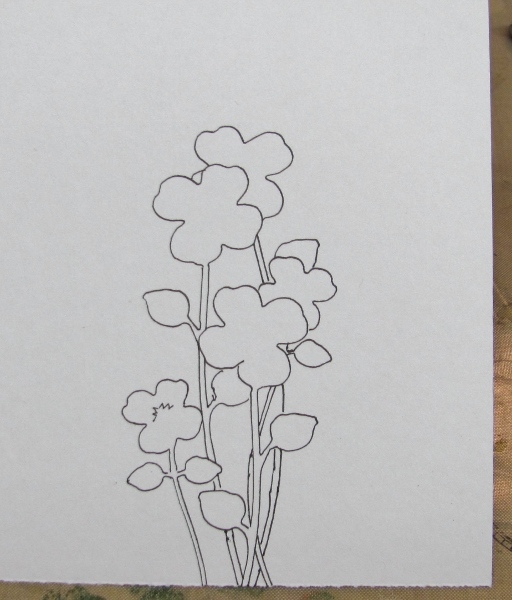 Then I placed the sprig and drew in the circles and a single line of stem. The result was a lot of fun but not quite there. I used the wrinkle free distress technique from Tim Holtz to color the background. After trimming to size I used some 'Old Paper' Distress Ink direct-to-paper to tone the edges. It got a very simple finish by mounting it to a rust-colored bordering panel. 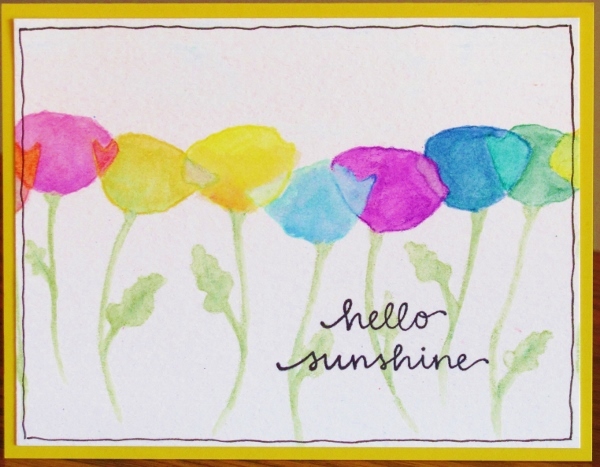 This might be a fun technique to use on a scrapbook page, too. 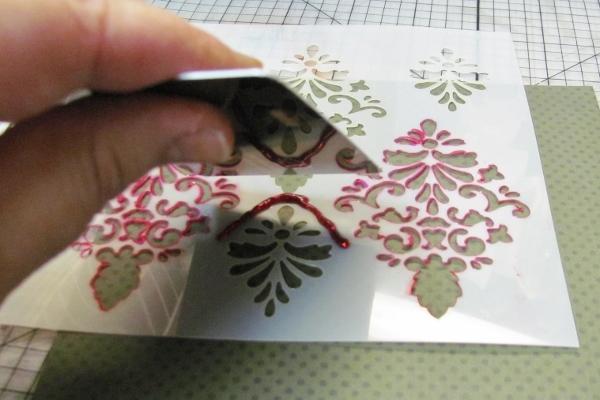 Today’s technique is a total departure from papercrafts and uses I the Damask stencil. 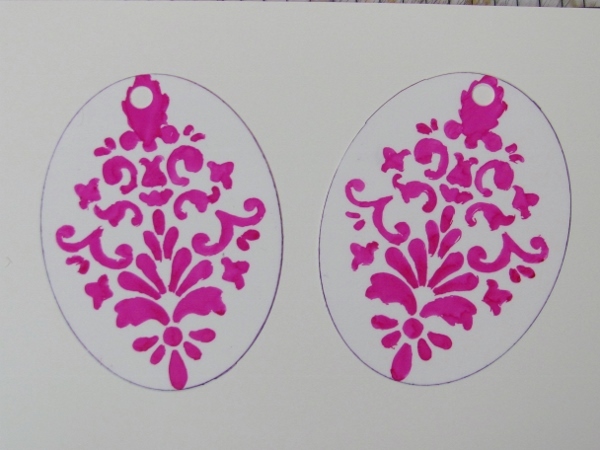 What a variety of ideas popped into my head for this stencil order from My Favorite Things . 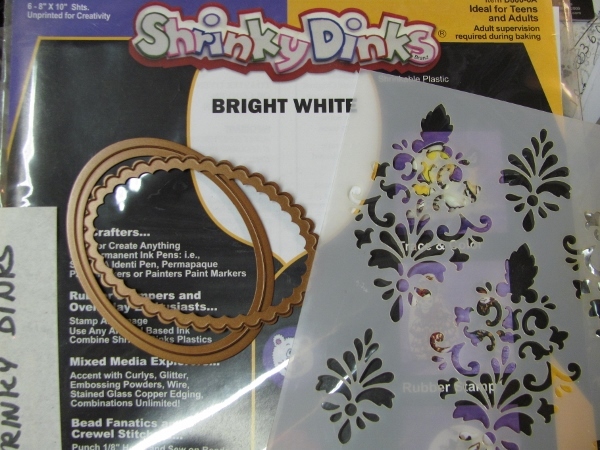 Once upon a time I had an inspiration to buy some Shrinky Dink plastic. So I did... buy it. I did not use it, but I did buy it. 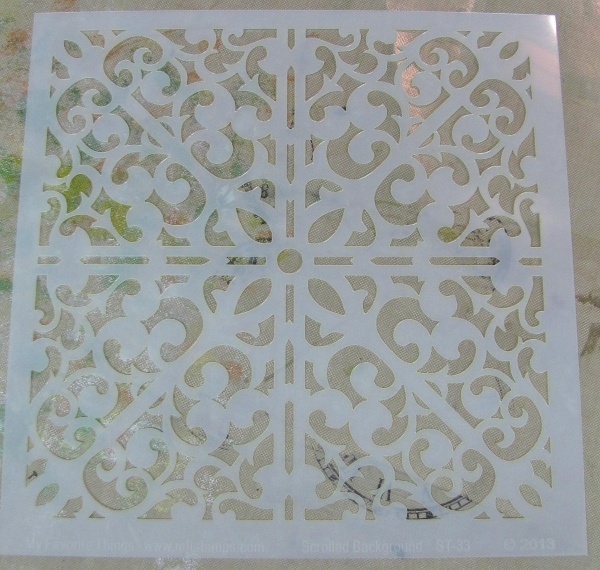 Well the perfect project came along when I got the Damask stencil.I also selected a couple of Spellbinders dies to cut the plastic with. 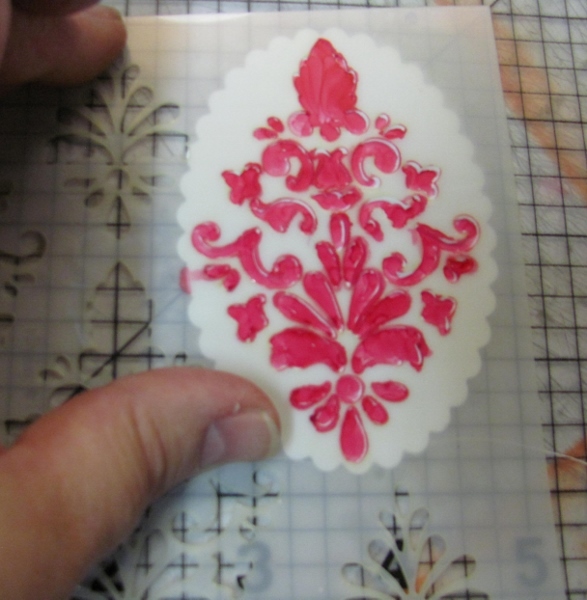 To get perfect placement of the Damask, the shrink plastic needs to be cut first. I did this in the Cuttlebug - one piece at a time (do not try to cut more than one layer). You will need to have two of each shape. 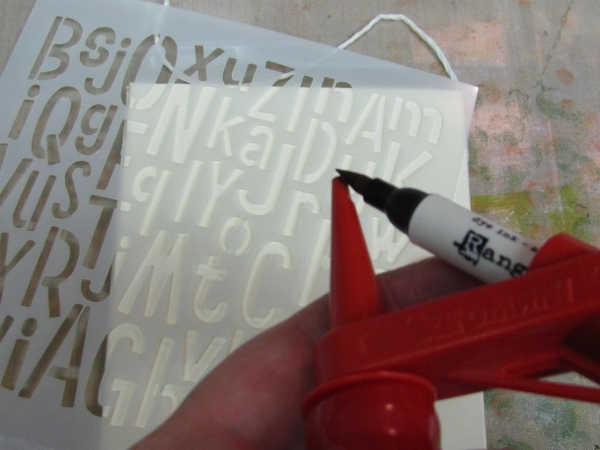 Line up your stencil on the shrink plastic shape. 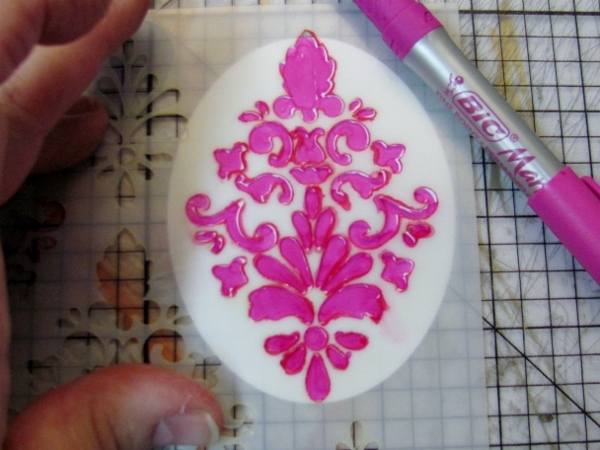 Use a PERMANENT marker to trace and color in your stencil design. I used Copic for the first set. Copic markers are pretty juicy so you can see where some color ran on the left side. This can be cleaned up with some blender solution and a cotton swab. 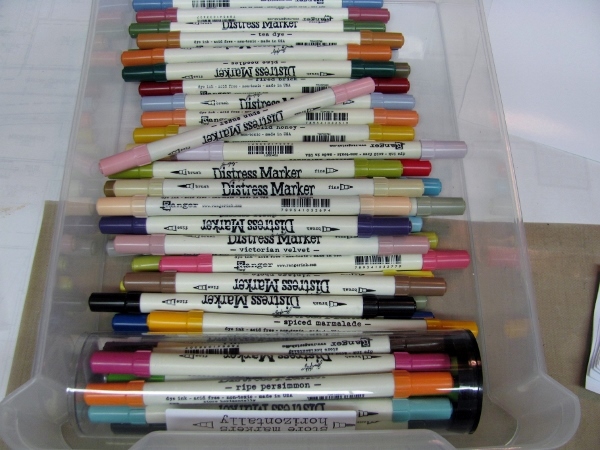 An alternative is to use Sharpies or Bic Mark-It pens as the tips are more rigid and their inks are not as runny. That's what I did with the second set with a much cleaner result. Next you need to punch a hole in the end. I used a 1/4 inch standard hole punch. Then take a permanent marker and run it around the edge of the shrink plastic shape. Screeeeech! Did you say 'oven'? Well, in reading the instructions (always a good idea) to see what temperature and time it would take for these pieces, I saw and was reminded that the shrinking could be done with a heat tool! Immediate gratification - I'll take that. So I laid the shrink plastic one at a time on my heat station and zapped it with the heat tool. What fun to watch it wriggle and squirm. When it was shrunk I slapped a COLD craft iron over it to make it entirely flat. 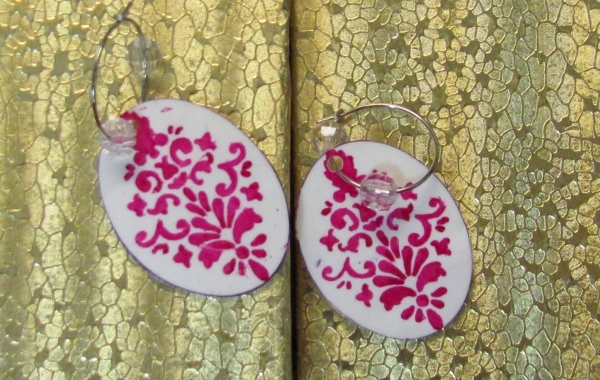 The addition of earring wires and some beads (to one pair) finished off these cute gifts. 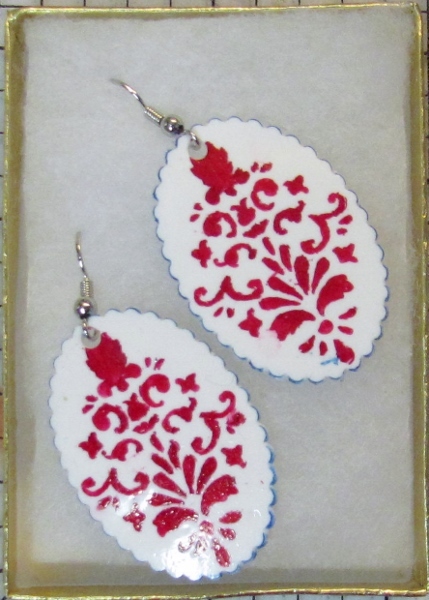 What an easy and elegant use of a stencil! 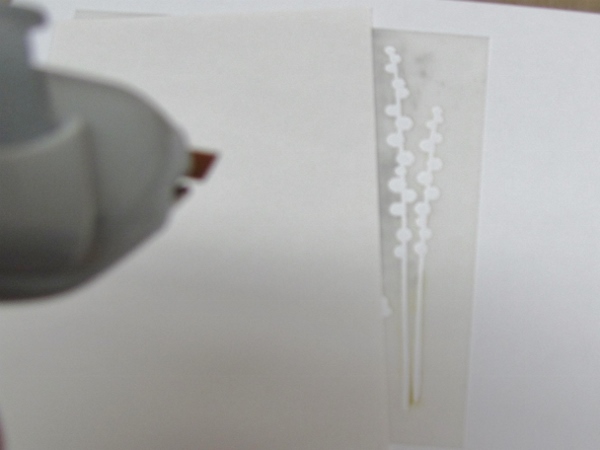 I have two techniques today using the Wildflowers stencil. My recent order from My Favorite Things was certainly a bonanza of inspiration. 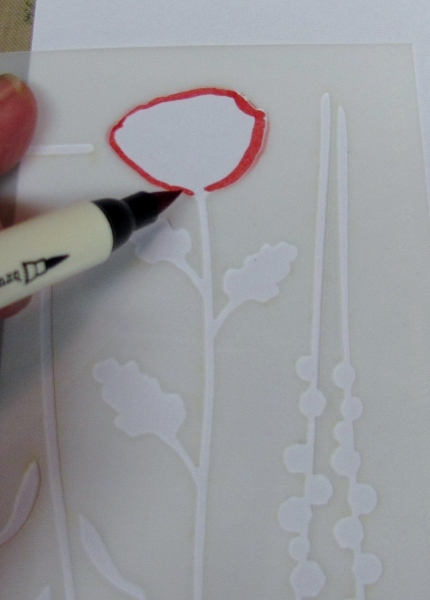 The first time I used this stencil I focused on the poppies. So I'd like to address the other two types of blooms today. For the first, I used watercolor paper, fine-line permanent marker, and Distress Marker. I used the marker to trace the outline of the four-petal blooms. I used both sizes in both the front and reverse images and mixed the stems as well. The plan was to create a pleasing arrangement. Because the stencil is firm it will not easily allow the pen to push it out of shape during this drawing process - a nice feature that prevents stray lines. Then I started adding some simple details - bursts in the centers, radiating lines from the bursts, veins in the leaves, dots in the centers. When the ink was dry I colored in all the image with a neutral Distress Marker. 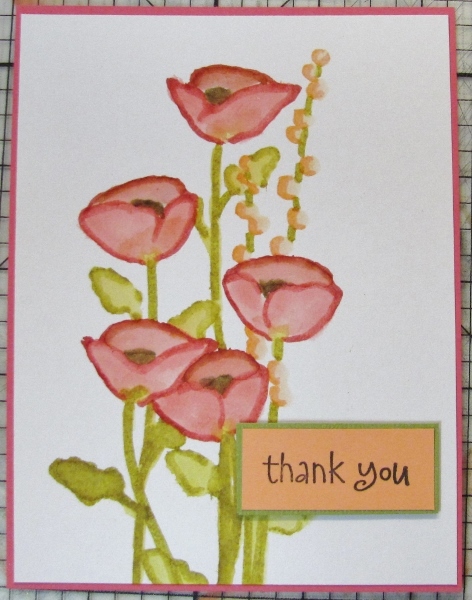 By banding in the same color as the marker and a simple sentiment stamped on white, this makes a calm card. 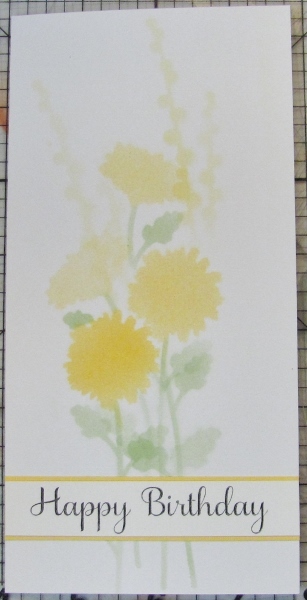 The other set of flowers on this stencil are daisies (or sunflowers). I decided to use Copic markers with the airbrush tool. 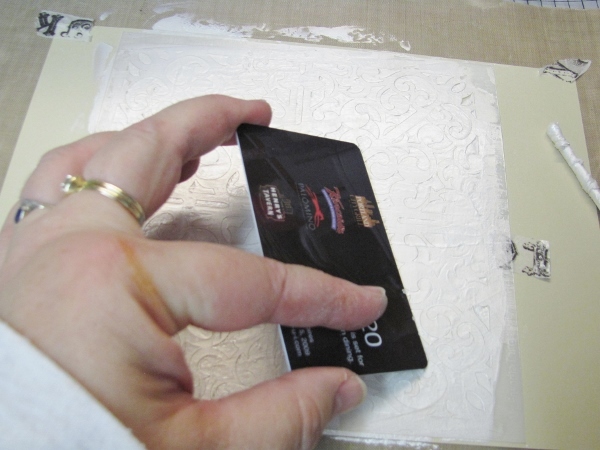 This requires a lot of masking so you don't get overspray into unwanted areas of the card. I used scrap cardstock and torn post-it notes. I first laid the stencil where I wanted it and then masked around the area I was using. 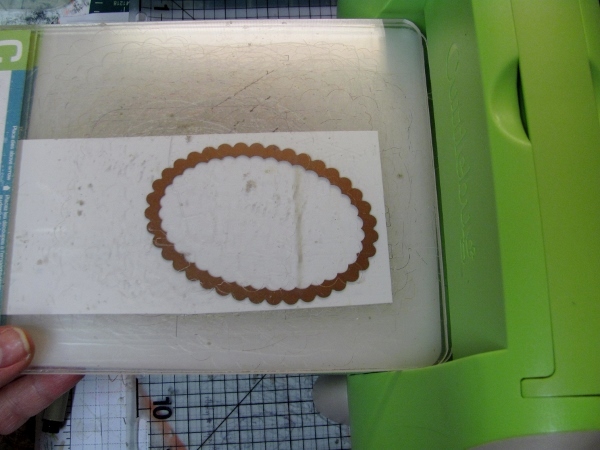 Then this area was sprayed with the air gun. A new bloom was selected, placed, masked, and sprayed. All of the blooms were applied and then the stems and leaves were added in the same manner. 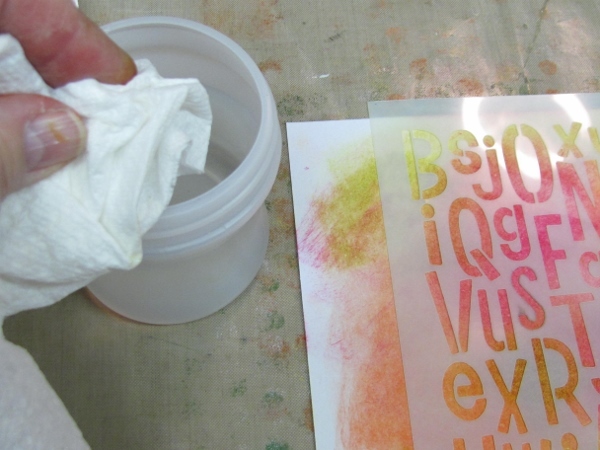 The Copic color from the spray is easily cleaned off the stencil with rubbing alcohol or Copic blender solution. Since the floral arrangement was so tall I decided to turn this into a tall card. 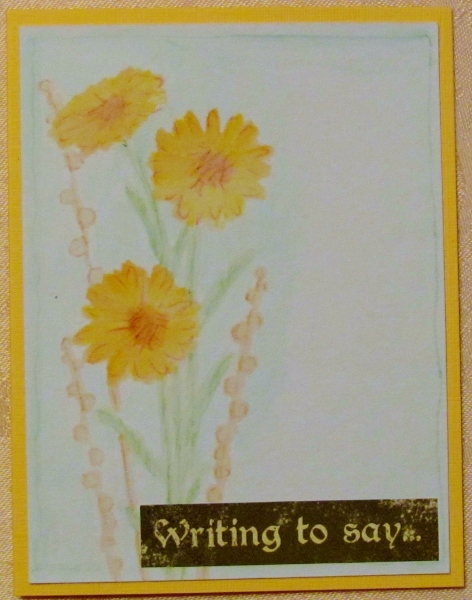 The sentiment was stamped on white cardstock and banded in yellow to match the flowers. I have a second technique today using the Scrolled Background stencil. This is from my recent order from My Favorite Things . 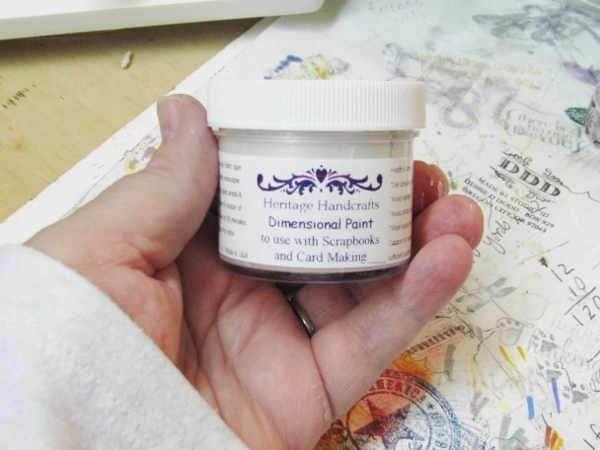 From way-way-way back I have on hand some Heritage Handicrafts Dimensional Paint. This paint has a pearlescent finish to it. I remembered it being kind of 'loose' so it squished under the stencil before. Not any more. Sitting on the shelf several years will firm it right up. LOL! 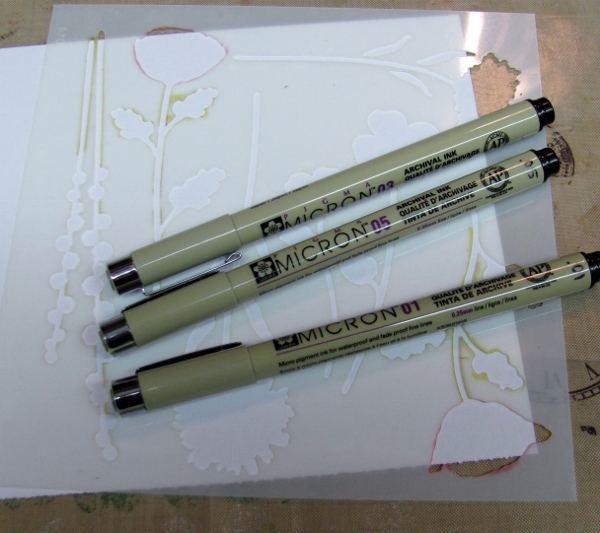 I taped the stencil to the cream colored cardstock and scooped out the very thick paste. 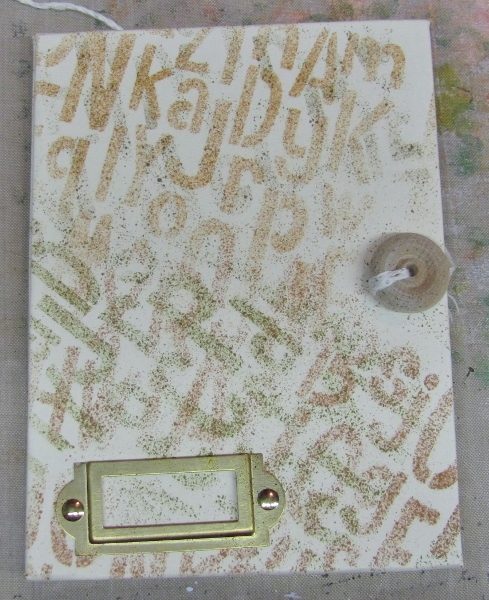 Then I used an old gift card as a squeege to scrape the paint into the openings of the stencil. I lifted the stencil carefully and you can see how clean the image is. While reading the jar to see how long it would take to day, I noticed that it said 'if you want more dimension, you can dry it with a heat gun'. Yes, Please! Oh, I think I'm in love! Look at that surface! Alas, all that puffiness is just air and a touch will collapse all those little pillows. So I touched it like crazy and ended up with a beautiful texture anyway. 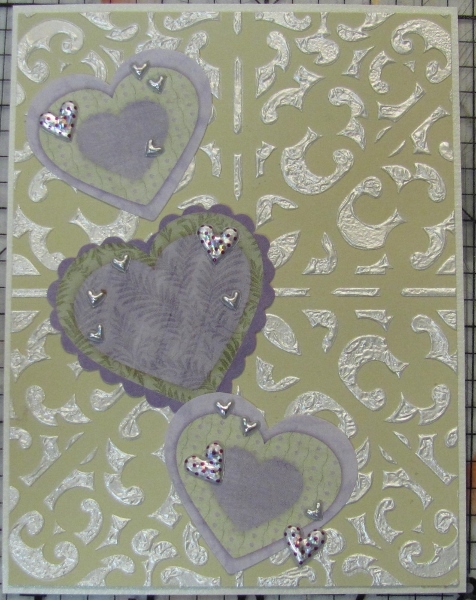 From this I made a card with heart stickers, some in cardstock and some puffy. You gotta know I am saving all the trimmings of these techniques as 'table scraps' for use on future projects. 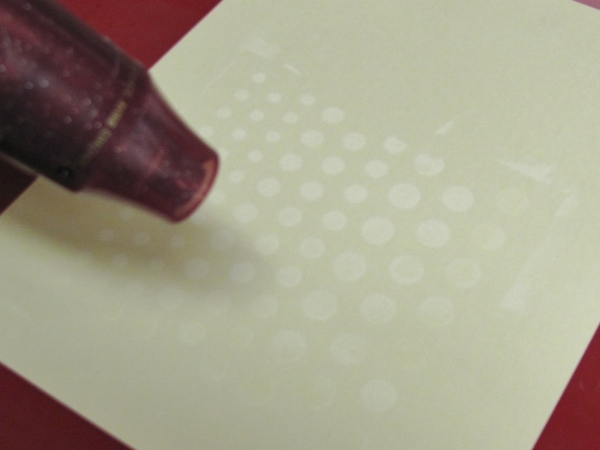 I have another technique to show you today using the Graduated Dots stencil. This is from my recent order from My Favorite Things. 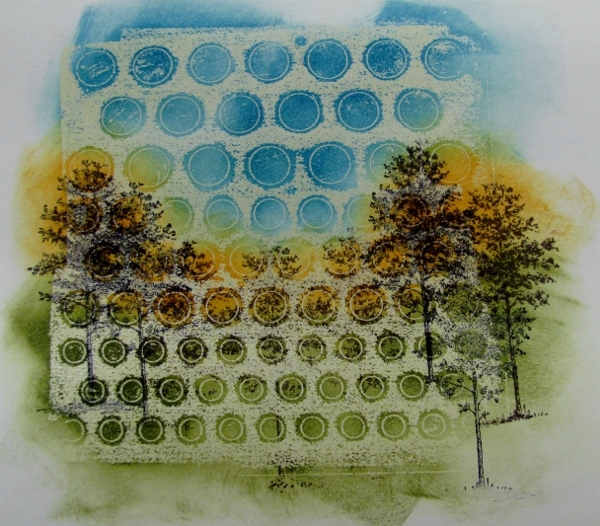 This technique uses Versamark, clear embossing powder, Distress Inks and StaZon Ink. 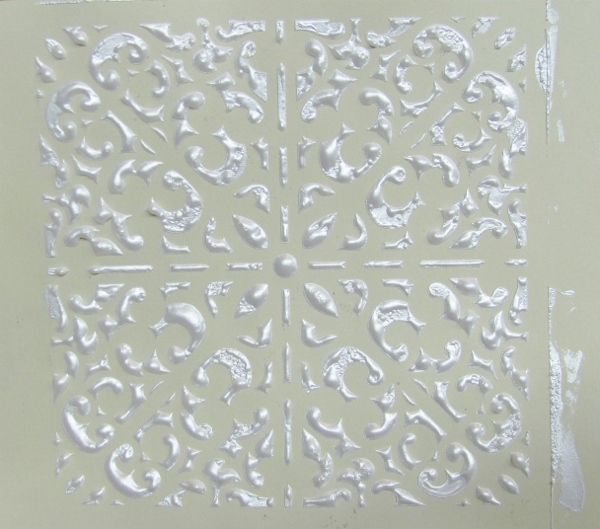 I am using cream cardstock as I wanted a light neutral but not too white. 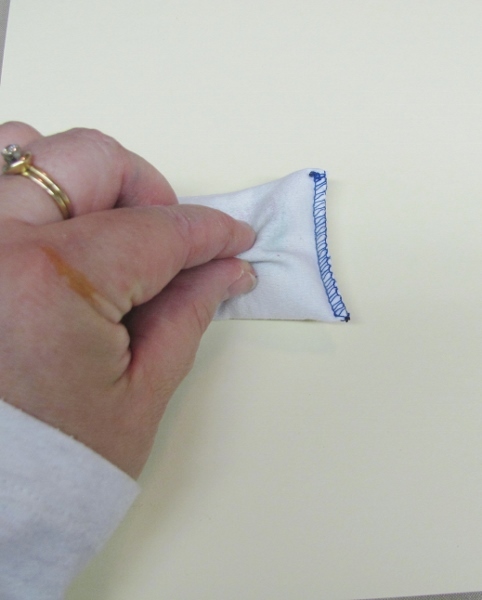 First, run an anti-static bag over the whole paper. 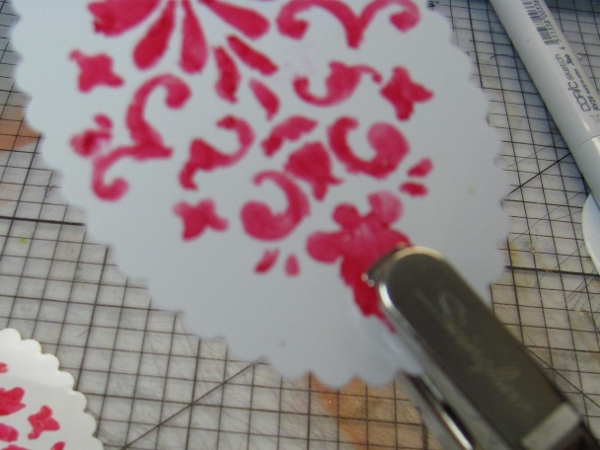 Tape the stencil in place with some low-tack tape or a post-it. 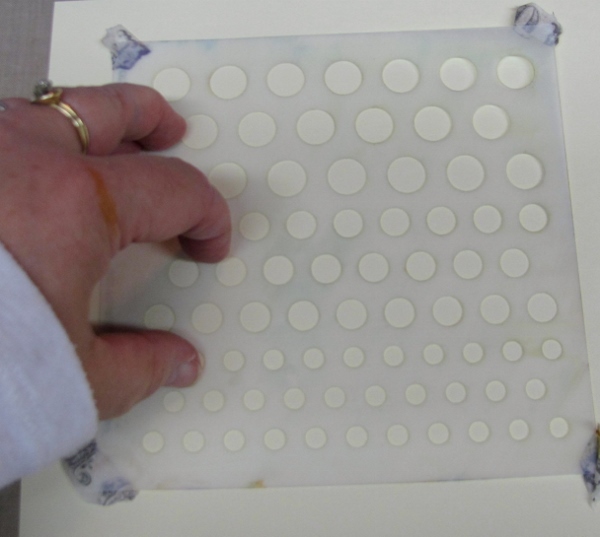 This will hold it in place while you mush the Versamark pad down over the stencil. You want to make sure your holes are all filled. 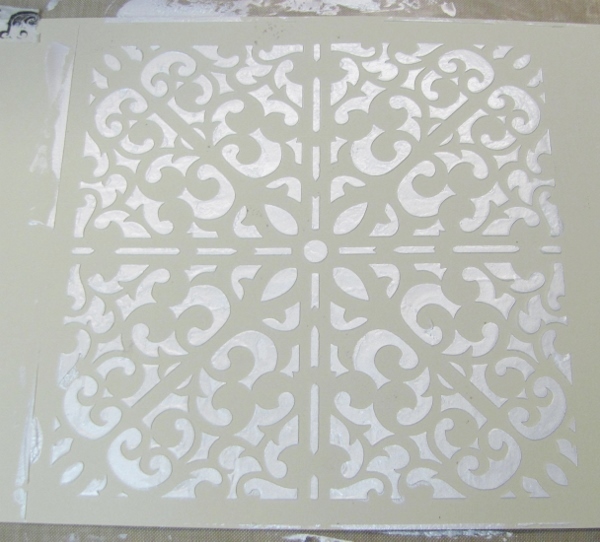 Then carefully lift the stencil off, turn it over and apply to a second sheet of cardstock. 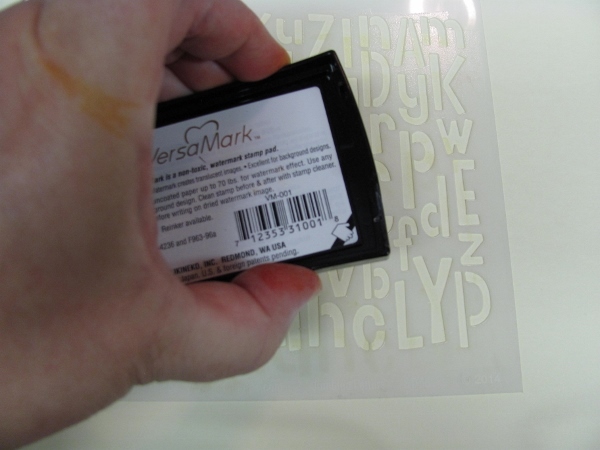 Rub thoroughly over the stencil to transfer the Versamark that was left on the surface. Cover first one sheet, then the other, with clear embossing powder. 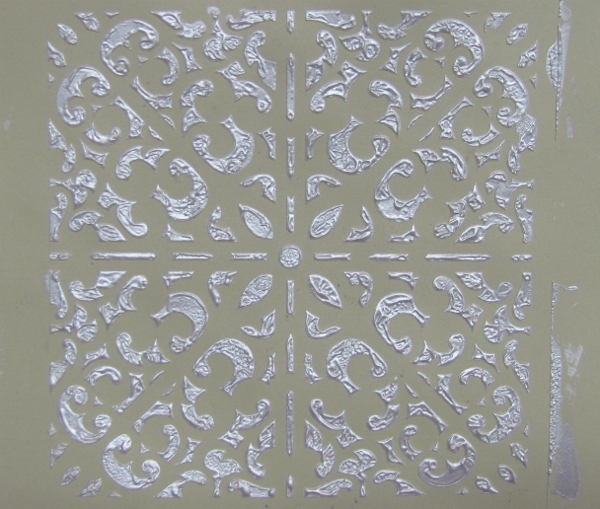 Now you have a positive and a negative of the design with an embossed resist. I used the positive design first. 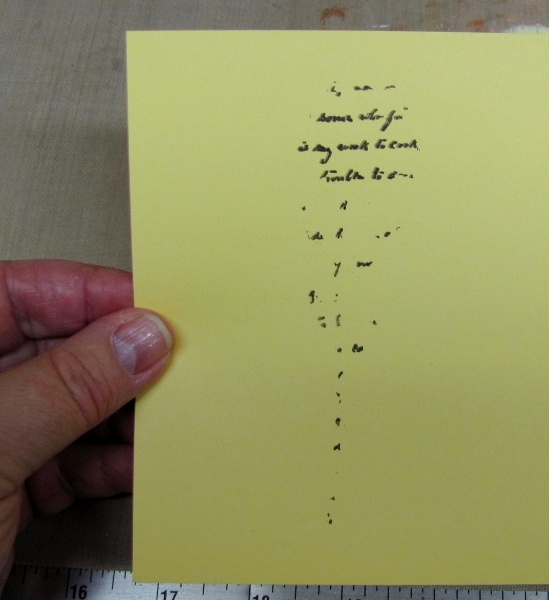 These were pressed direct to paper over the surface. 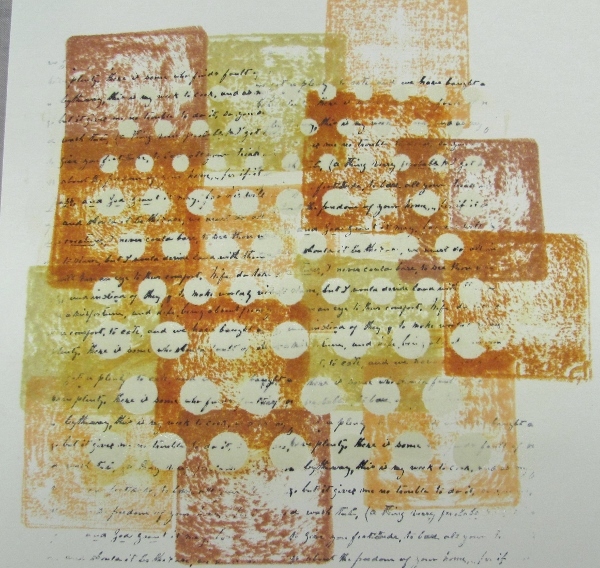 I selected a stamp of 'unreadable text' and black StaZon ink. The text was stamped randomly and unevenly over the surface. 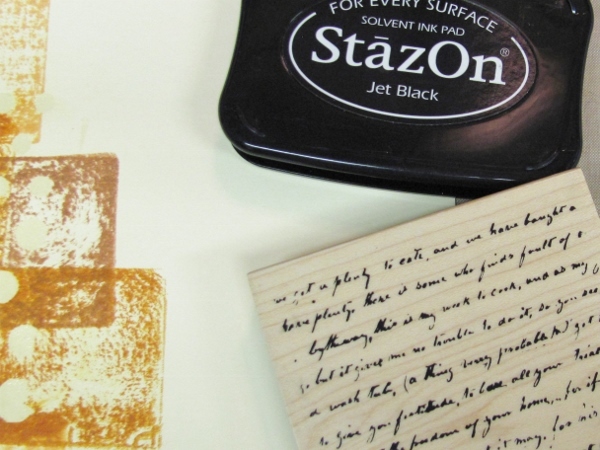 The StaZon allows the ink to adhere to the embossing, making it permanent. 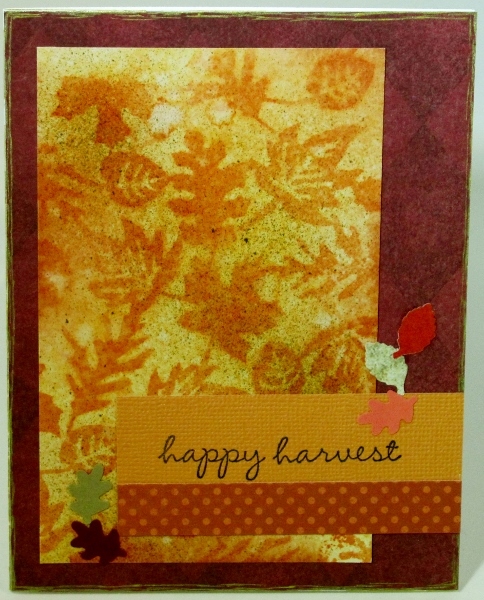 The card I made with this features a strip of houndstooth scrapbook paper and some floral stickers from my stash. For the negative version of the embossed resist I used a green, an orange, and a blue Distress Ink so I could create a scene. 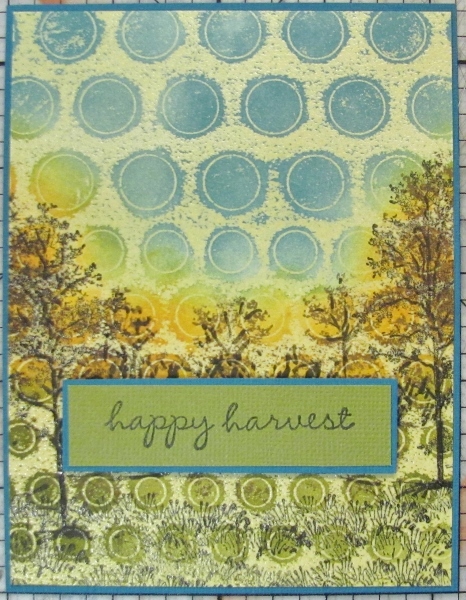 With the smaller dots at the bottom, I used a sponge tool to make a green 'ground' area. I then sponged on the orange to create a 'tree' area. 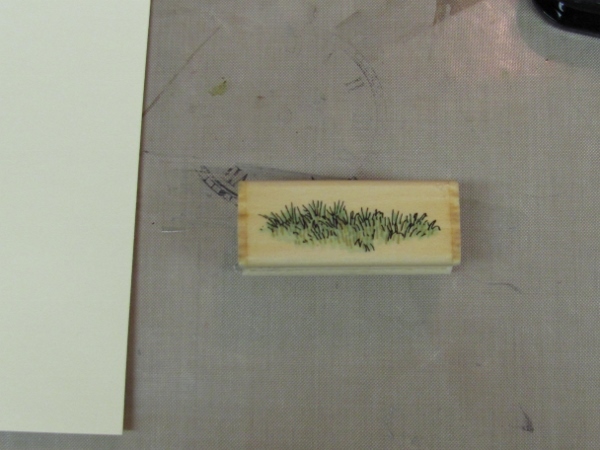 I used black StaZon to stamp trees, tall ones on the outside edges and low ones in the middle. 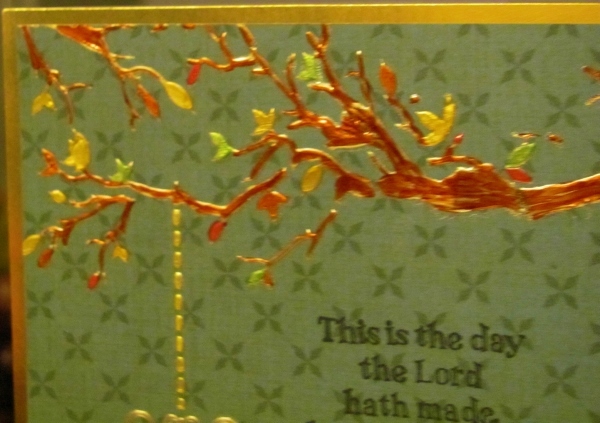 The card made from this is banded in teal to bring out the color in the sky. A stamped greeting is banded and popped up on foam tape. 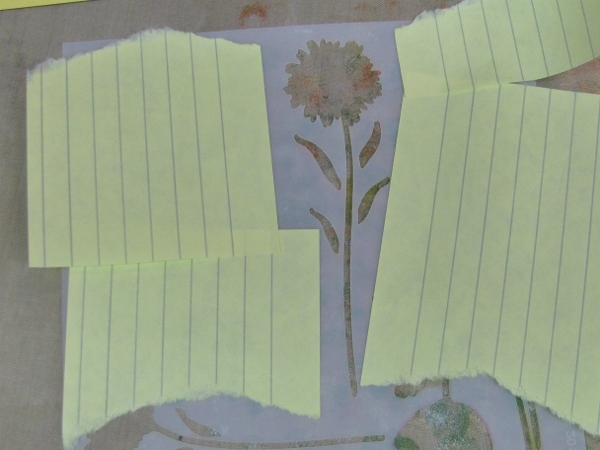 TWO IMPORTANT NOTES about this technique: 1) be prepared with TWO sheets of cardstock so you get your positive and negative. 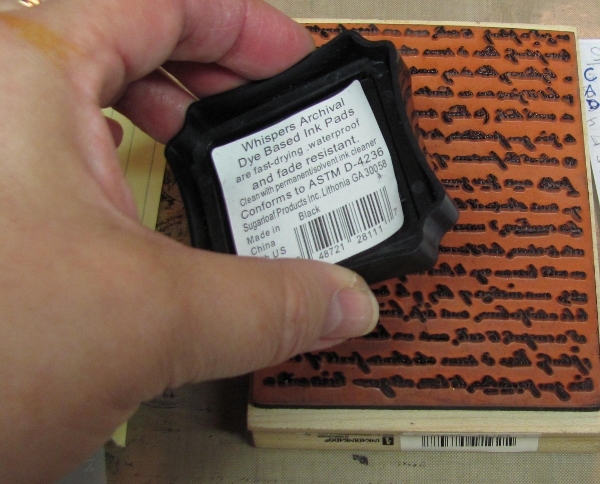 2) when you do you initial mushing of the Versamark, be generous so your reverse imprint will have plenty of ink to transfer. I have very different stencil today from the recent My Favorite Things order. 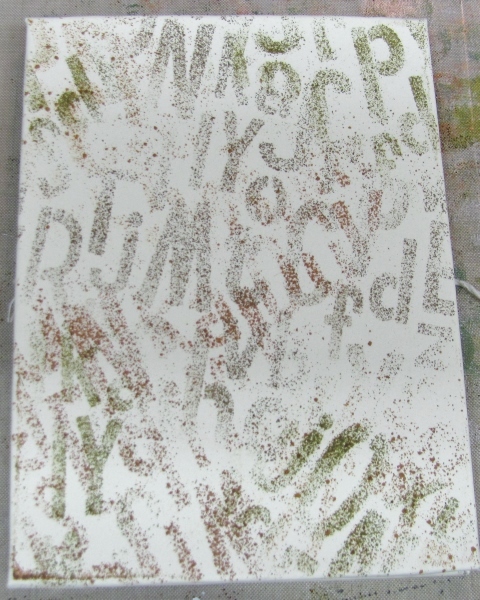 The stencil I am using today is Jumbled Letters . It has whole alphabets carefully arranged to not spell out anything or be in alpha order. Letters sometimes appear more than once and there is a mix of upper/lower case and a range of sizes. Over all it has the feeling of graffiti to me. I had a blank book on hand that I've been wanting to alter and this seemed like the perfect project. 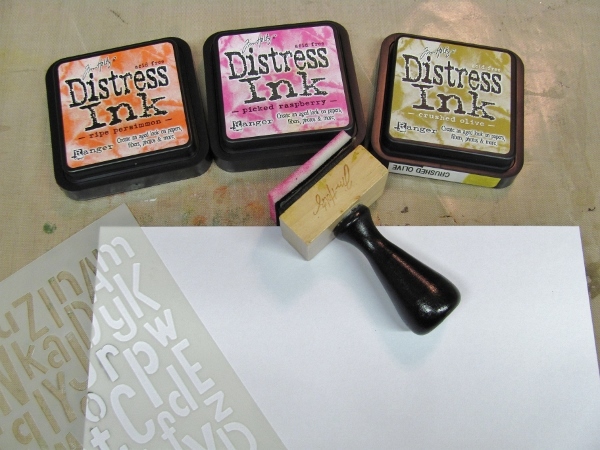 I laid out Distress Markers and a bulb sprayer to apply the ink. 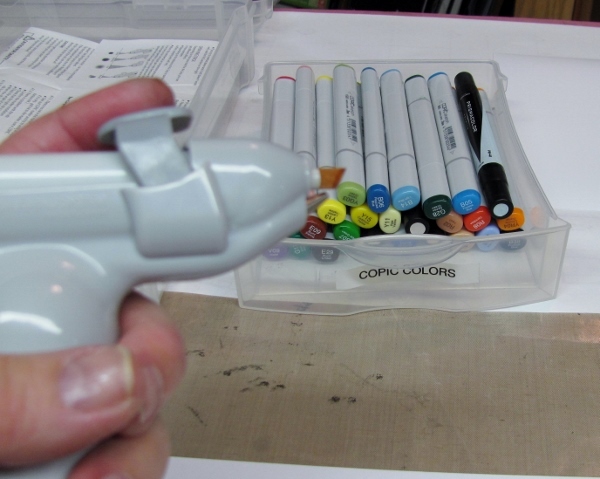 I've had that sprayer for eons and used it originally for my Momento brush markers. 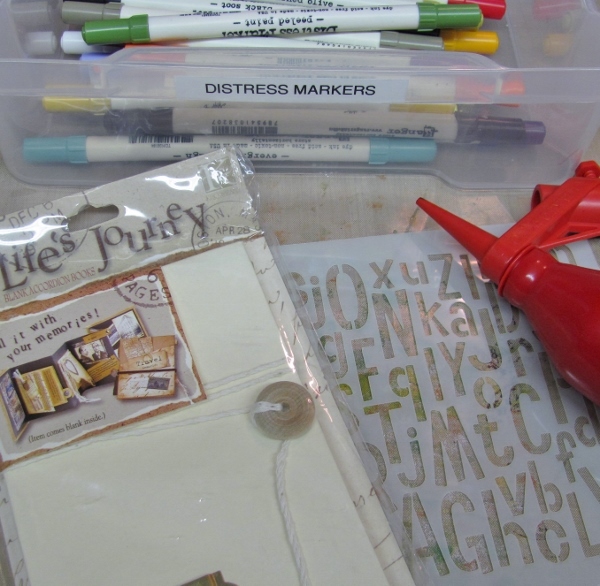 When I saw that Tim Holtz had a version on the market it reminded me that I had this one and I kept my fingers crossed that the Distress Markers would fit. First I had to find the thing. After lots of searching it turned up... in the drawer with the Momento markers. Since the cover was cream colored I selected all earthy tones for the sprays. I laid the stencil off kilter on the cover and spritzed with one color of marker. Then I moved the stencil and sprayed with another color. This was repeated until I liked the cover. 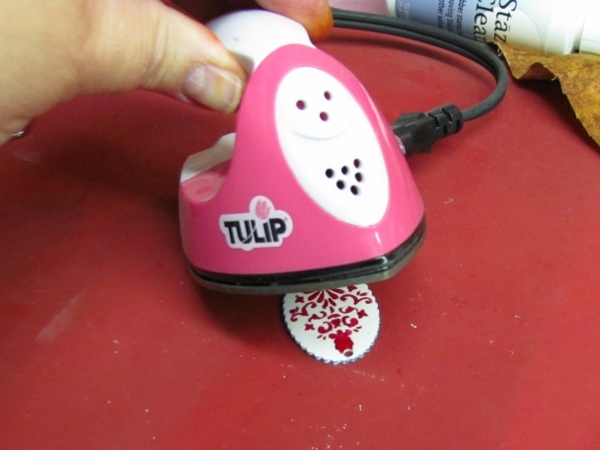 The flexibility of the stencil allowed it to ride up and over the button and metal plate without issue. Back on the front cover, I lined up letters one at a time and traced them with a darker marker, for the title. This is the final product, ready for content. Now I just have to decide what the story is! 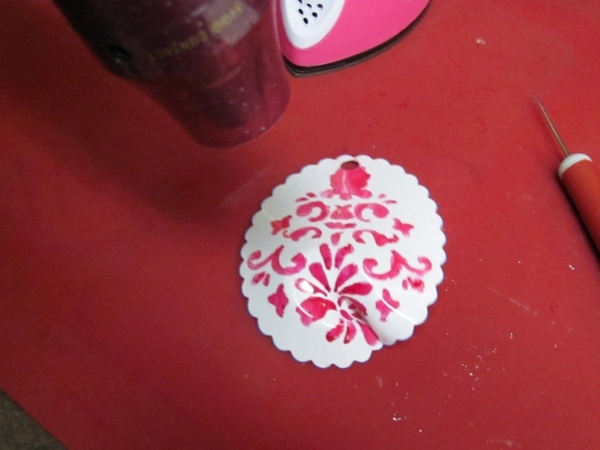 I have another stencil tutorial today from the recent My Favorite Things order. 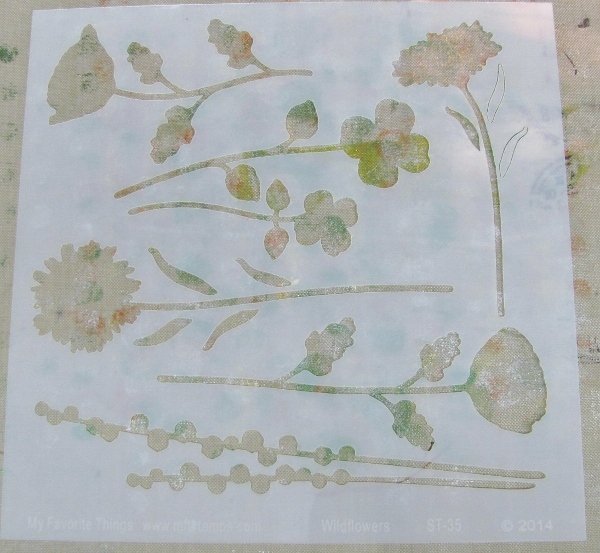 The stencil I am using today is the Wildflowers . It features four styles of flower silhouettes with two versions of each. 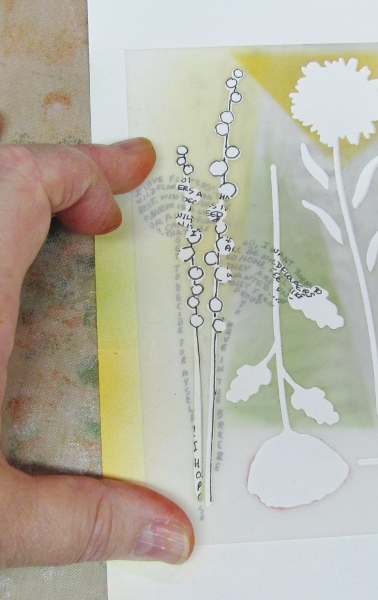 These can be combined in a number of ways – turning the stencil over to make a mirror image, mixing the stems and leaves, using different types of flowers together – for a wide variety of looks. 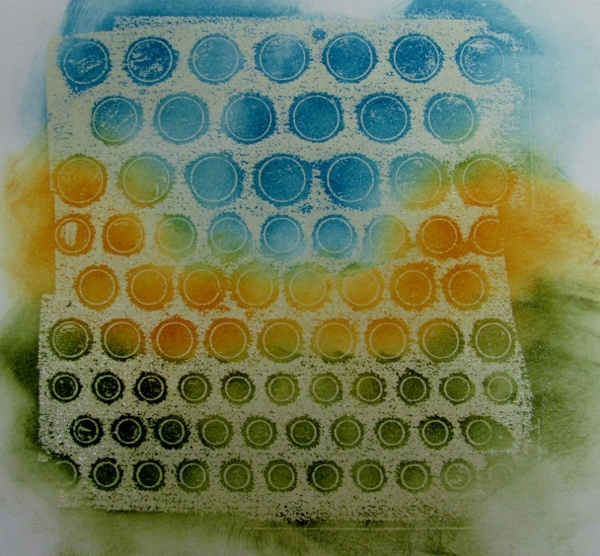 The technique today uses Distress Markers. 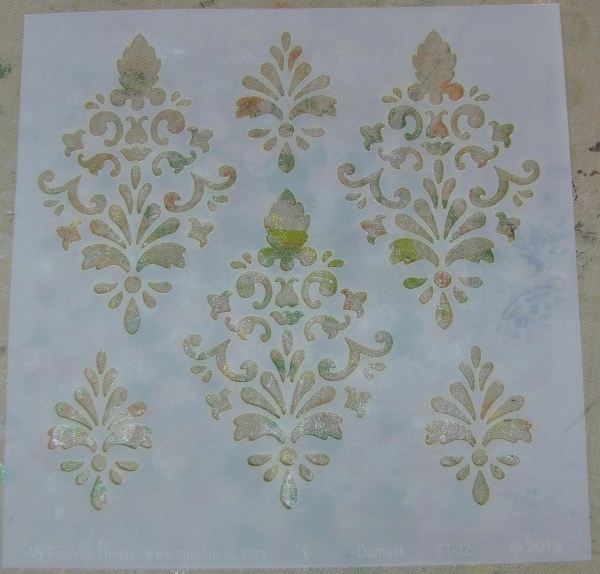 Lay the stencil on watercolor paper. 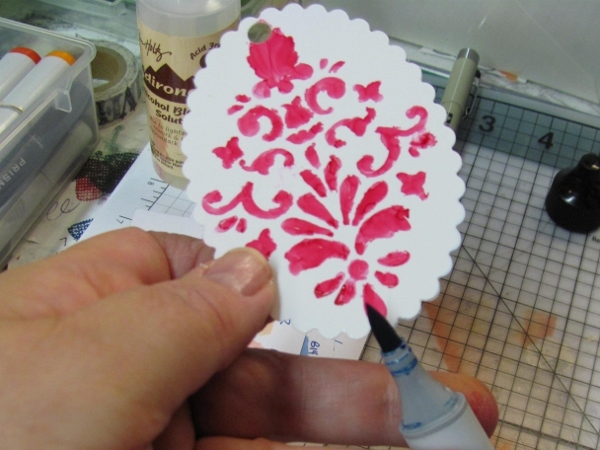 Use the brush end of a marker to outline the shape inside the stencil. 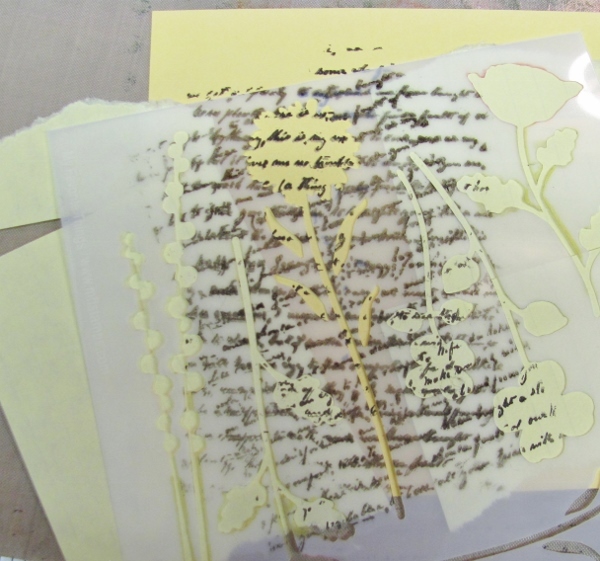 Continue with other colors, moving stencil as needed to complete an arrangement. 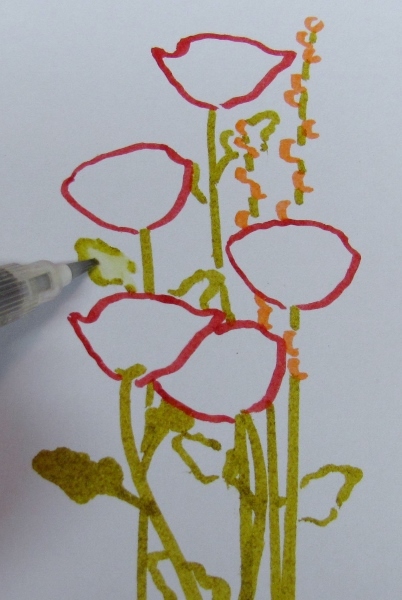 Use an aquabrush to draw the ink in from the outlines to the open spaces in the leaves and stems. 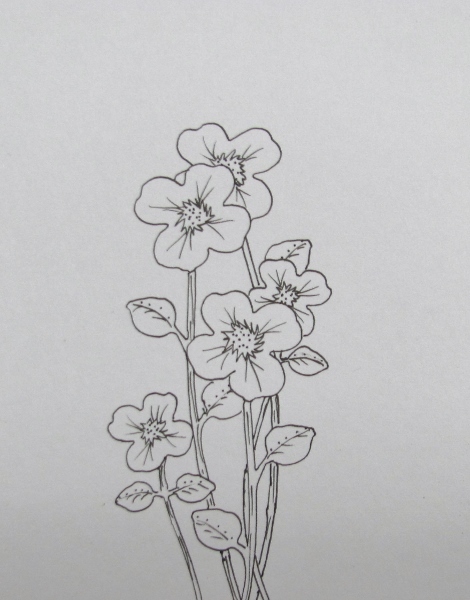 Add some detail lines inside the flowers. Use the aquabrush to spread this color inside the flowers. After trimming, I bordered my panel and combined it with a popped up stamped sentiment to create this card.